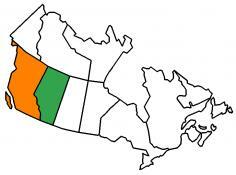 We crossed the border at a little town called Coutts, AB. It went without a hitch as John and Linda went first and paved the way for the rest of us. Just the usual “Do you have any fruits and vegetables?” question and I was back in the good ole USA. 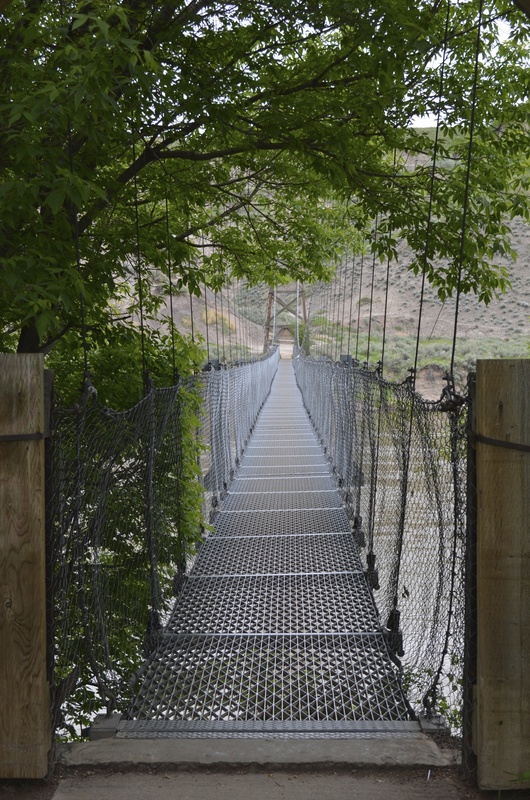 Here is a pic of me crossing the border taken by Linda of adventureswithsadie blog fame. 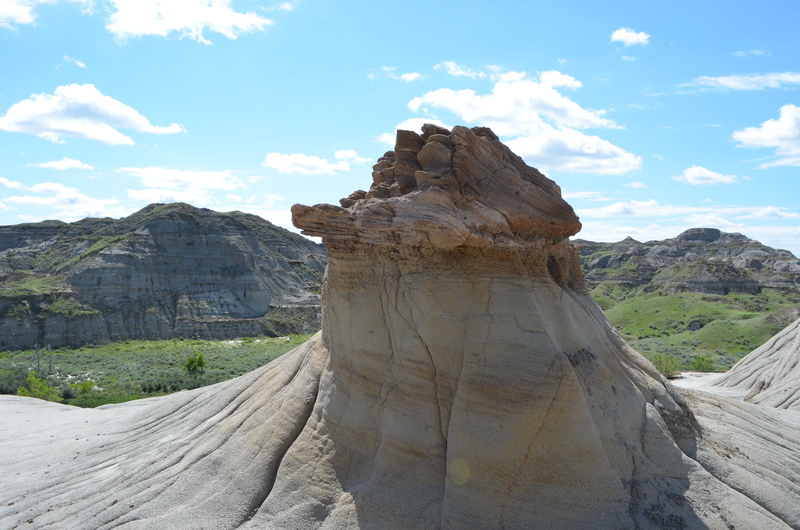 As much as I enjoyed this trip throughout Alberta, I am really glad to see the prices go down for gas ($3.65 vs about $4.62 per gallon) and wine ($9.99 vs $5.90 for a bottle of Yellow Tail). The day started out beautiful but as soon as we got across the border it started to rain. It was a huge downpour and it was difficult to even see the road for a while it was coming down so hard. It then turned to a light rain which followed us almost into West Glacier NP. 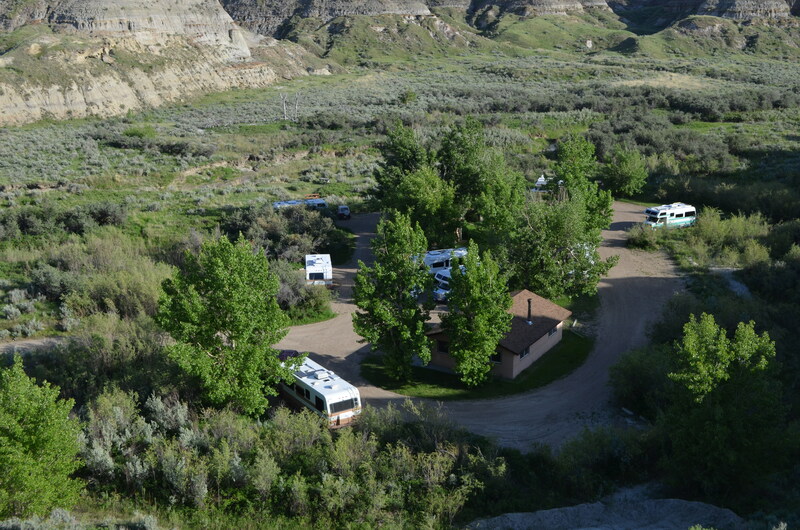 I had made reservations online prior to the start of the trip for 2 days at the Fish Creek Campground. We were all camped in Loop A for our final get together. 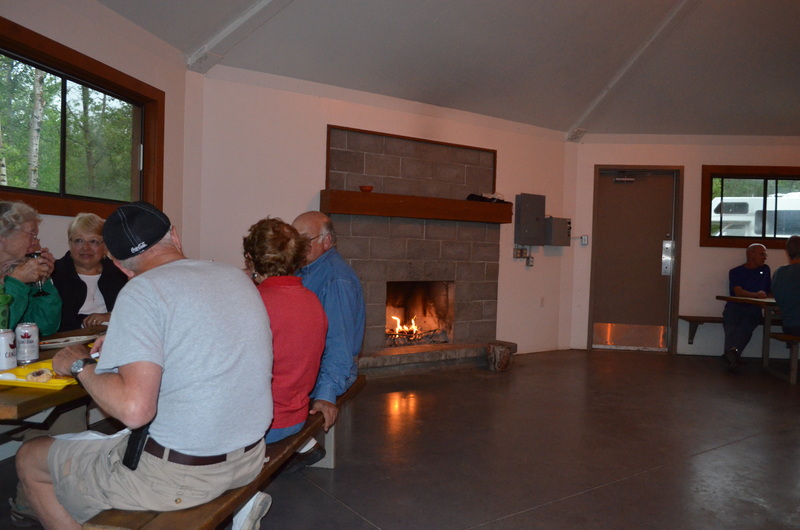 Everyone in the group had made reservations for 2 nights. 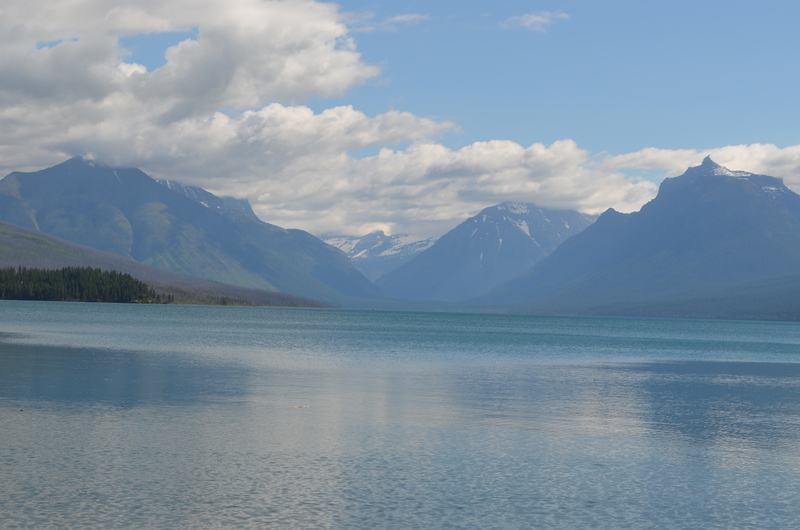 This is a couple of pics of Lake McDonald from the Visitor’s Center boat dock. 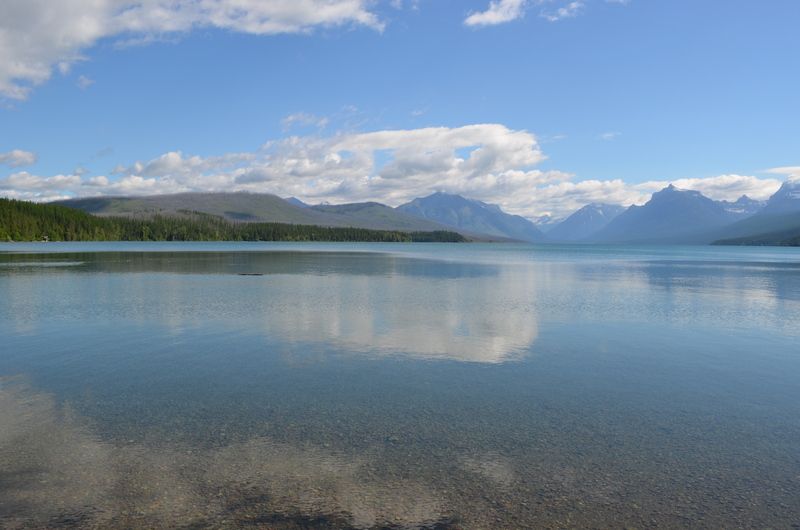 Fish Creek is located on Lake McDonald on the west side of Glacier NP. It was a beautiful setting among the trees. I got settled in and took Chica for a walk. We hadn’t gone 100 feet, when a large deer crossed the road in front of us. At first both the deer and Chica stopped and just stared at each other. Then as the deer started across the road Chica began getting braver and started to bark. It was very funny. 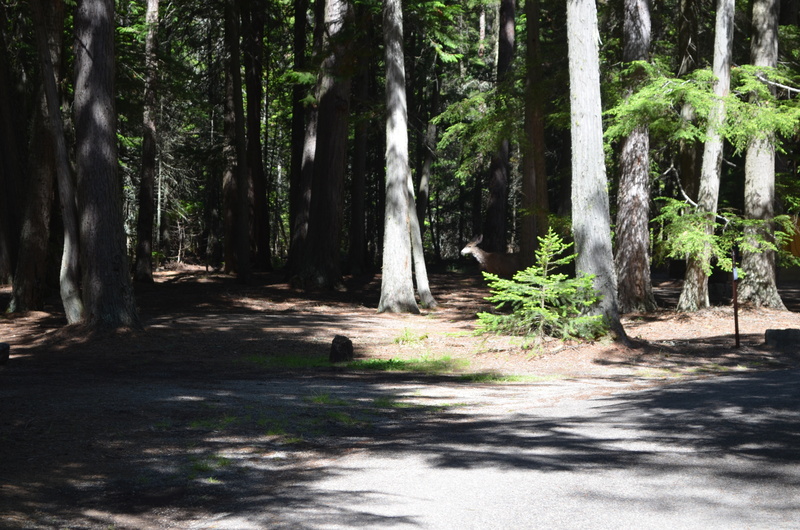 Sorry but I didn’t have my camera at the time, but this is the same deer I saw later looking for food inside the campground. It is between the two tall trees just right of center. 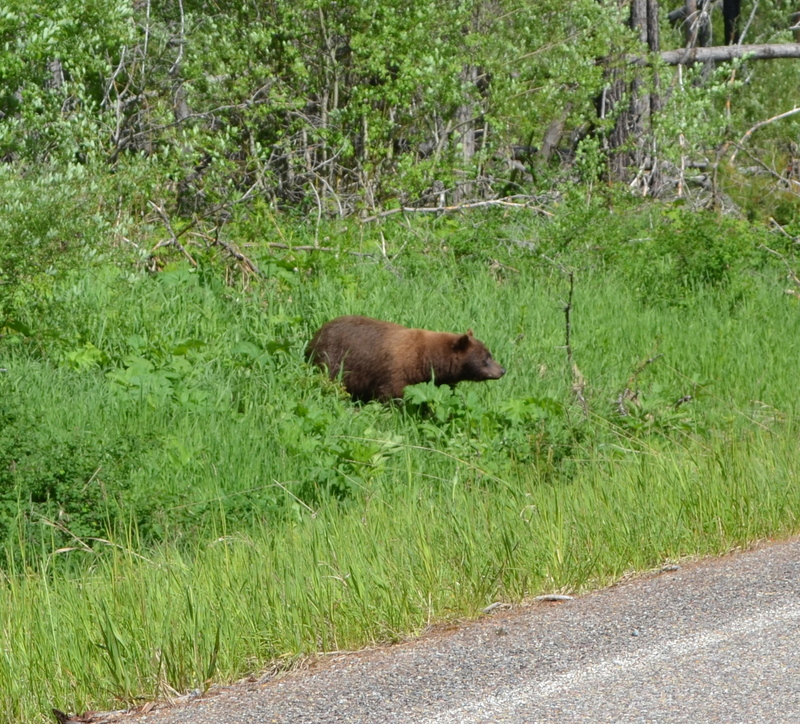 I Brake for Bears too! The next morning I decided to take a drive north of our campground. About 10 miles up the road I saw a bunch of cars stopped on the road. Up here that only means one thing. There must be something for a photo opportunity. 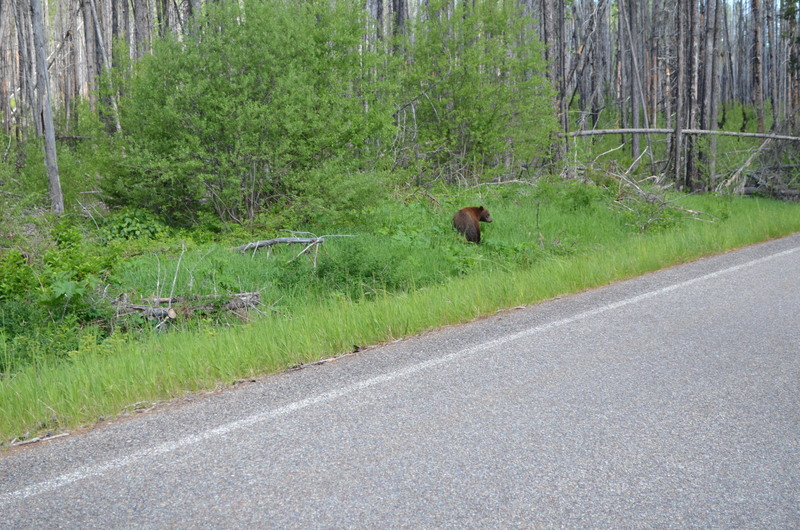 I stopped also and sure enough there was a black bear (only it was colored brown) foraging the area at the side of the road for food (probably berries). I didn’t want to get too close to this guy. 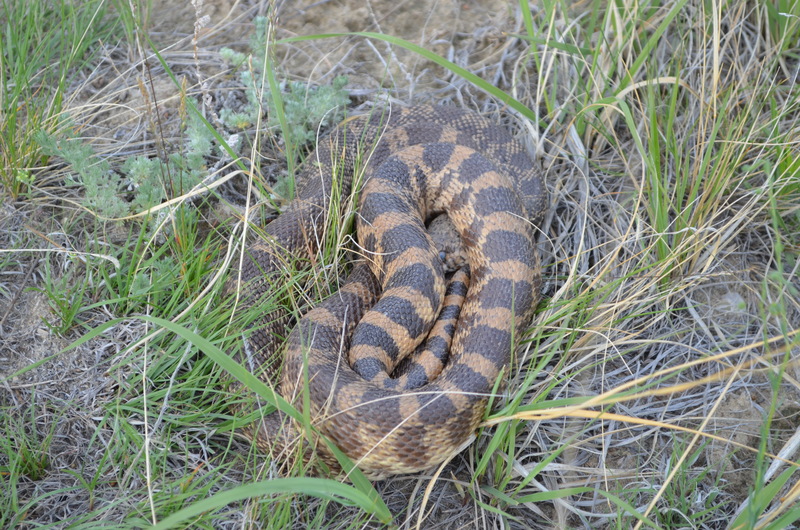 I may have come within a foot of a rattlesnake but did not want to get within a foot of this guy. That night we all met for a 75th birthday party. Randy found out he was not the only one celebrating this milestone birthday. 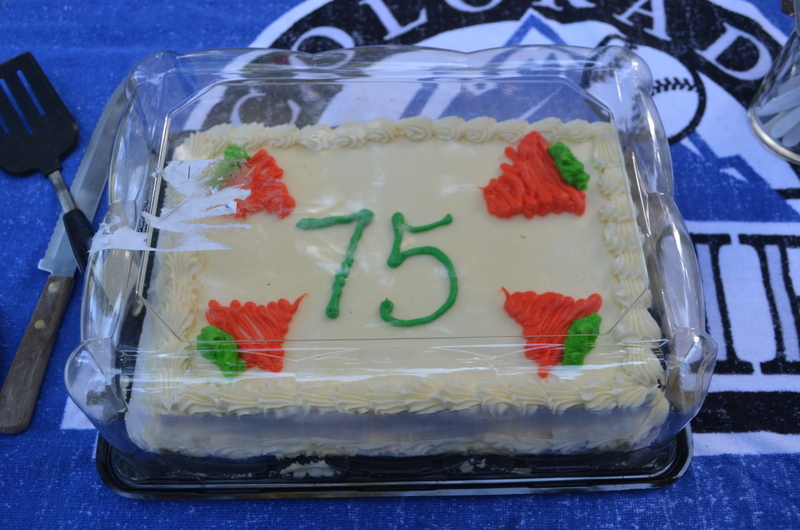 After checking with all the others in our group, he found out that there were 6 of us who have or would be celebrating their 75th birthday shortly. So he and Suzanne bought a cake and we all celebrated with them. Here is Randy emceeing the party. Here are the 75’ers. Age means nothing to any of them as they were all very active. From left to right standing, Linda, Al, Randy and Suzanne. Sitting is Dian and Pete. Happy 75th guys! I hope I too will be as active at that age as you are. We had fun getting together for the celebration since it was our last night together. 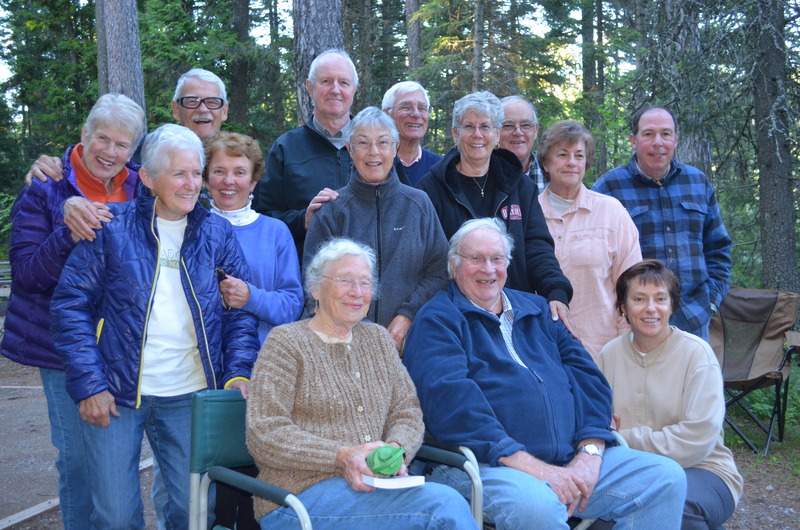 We took a group picture of those camping at Fish Creek. 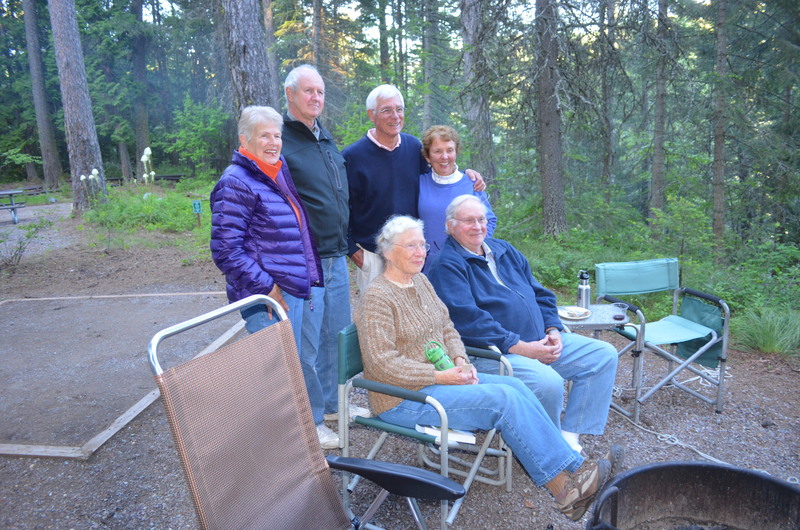 However it is missing John and Linda, Coy and Cynthia, as well as Tony and Michelle who departed earlier. Standing from left to right: Linda, Carole, yours truly, Suzanne, Al, Anna, Randy, Nikki, Steve, Pam and John. Sitting and kneeling: Dian, Pete and Zoe. 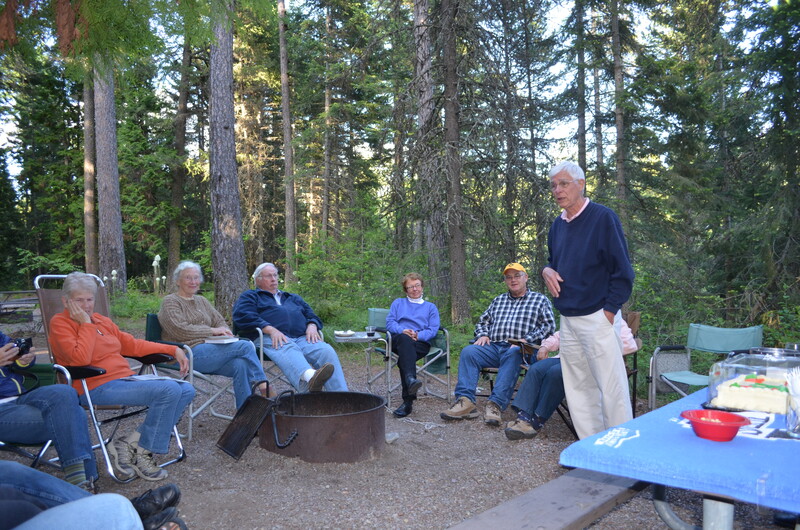 Pete from the Lazy Daze Northwest group was the wagon master for this wonderful trip. I only knew a few people prior to starting this adventure, but got to know everyone before it ended, I had a fabulous time and it is an adventure I will never forget. 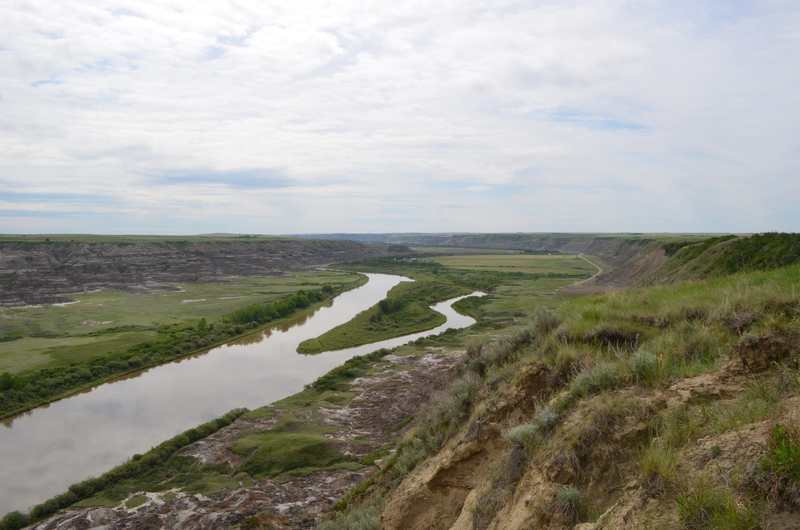 I had never been in Alberta before but certainly enjoyed all it’s beauty and the congeniality of it’s people. Many thanks to Pete for organizing such a wonderful trip and to John and Linda who suggested it to me back in January at Quartzsite. Plus to all the wonderful people who went on this trip who I can now call my friends. I know we will all meet up at other times throughout our adventures. This was our last stop in Canada for the night. 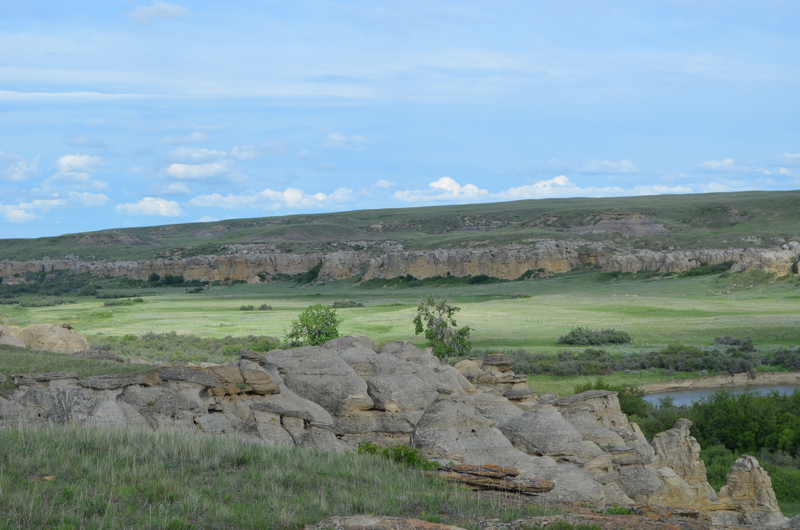 We all stayed in a group campground among the cottonwood trees right next to the Milk River at the Writing-In-Stone Provincial Park. We all went on the tour of the park that took us to the petroglyphs. 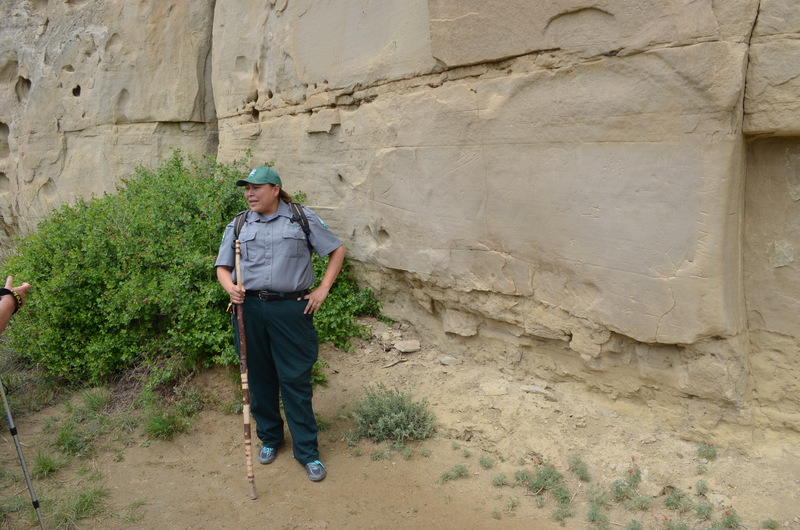 Our Blackfoot Indian guide took us to the various spots where there was writing. She would explain the meaning of the writings and also got into a lot of detail of life for the Blackfoot Indian, both past and present. The petroglyphs are difficult to see thru the camera lenses so I hope you can make them out. 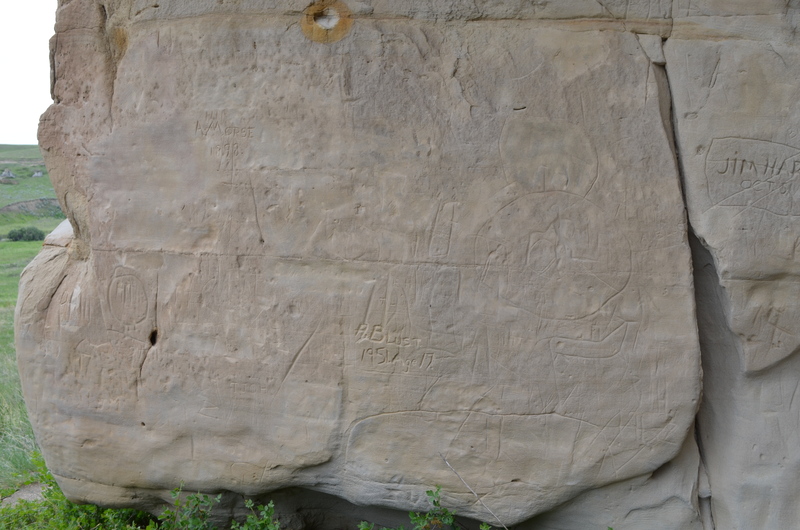 There were also names and dates carved into the rock by the people of this territory who were not Indians. They decided to leave some of the early ones in place as it told of the people who settled here many years ago. There was also a bit of graffiti as well which they would remove. 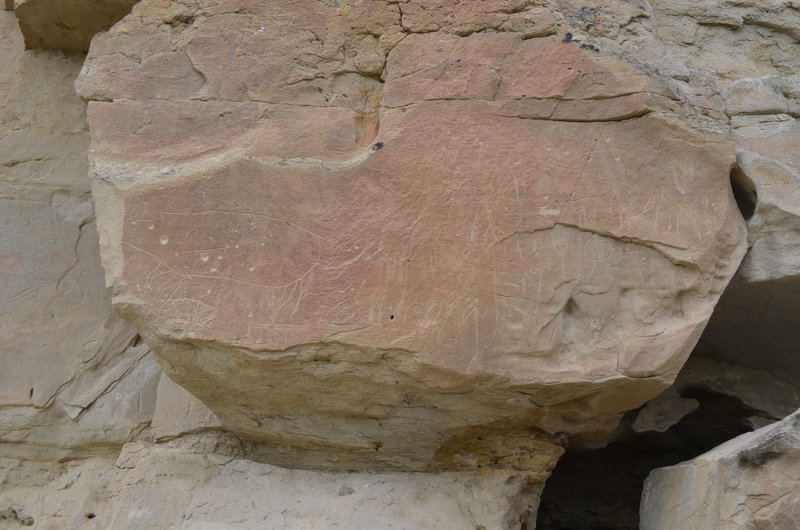 This is considered to be the last petroglyph that depicted how difficult it was to get to these rocks. 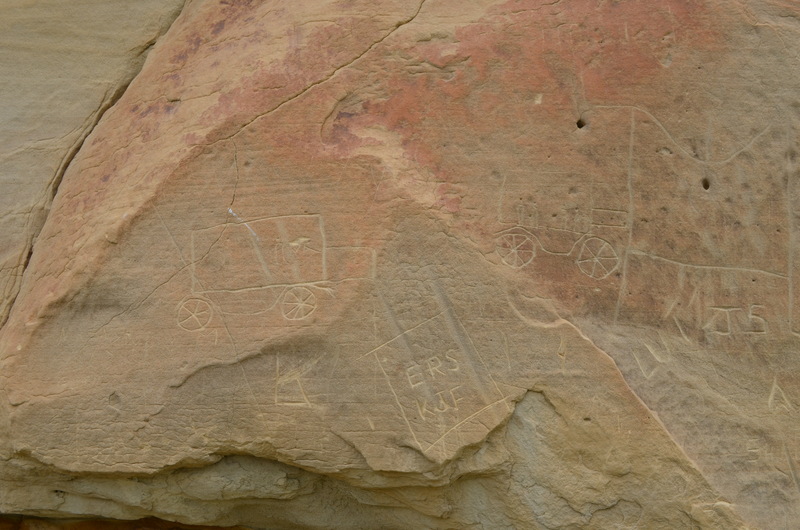 It was made in the early 1900’s and shows the trucks the Indians used to travel to this spot.. 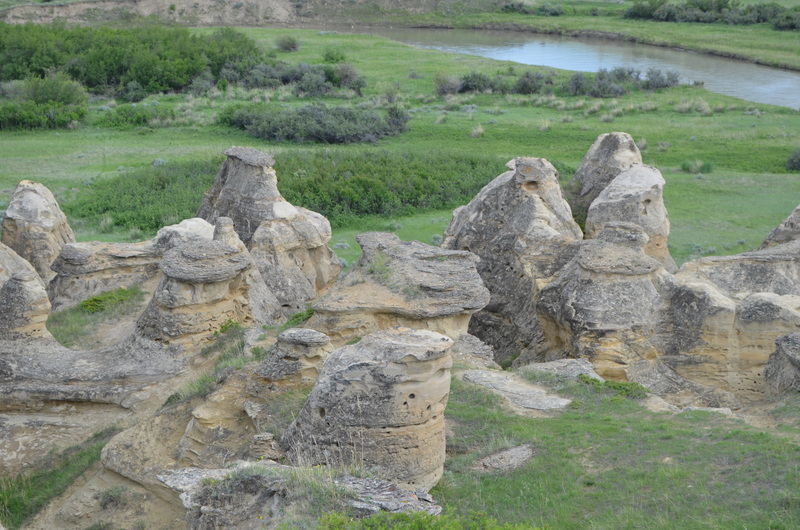 There are many hoodoos and different types of rock formations throughout the park as you can see. 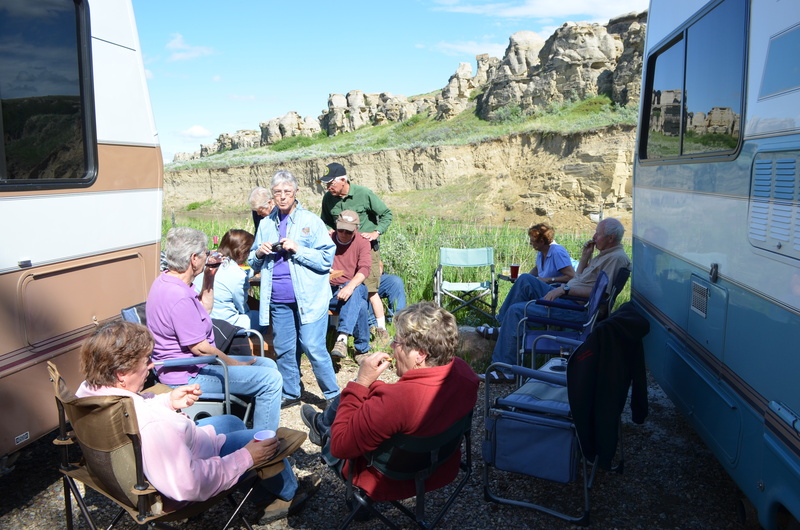 Here we all are having our Happy Hour right next to the Milk River. Then I went with Linda and Carole to get some nice pictures. 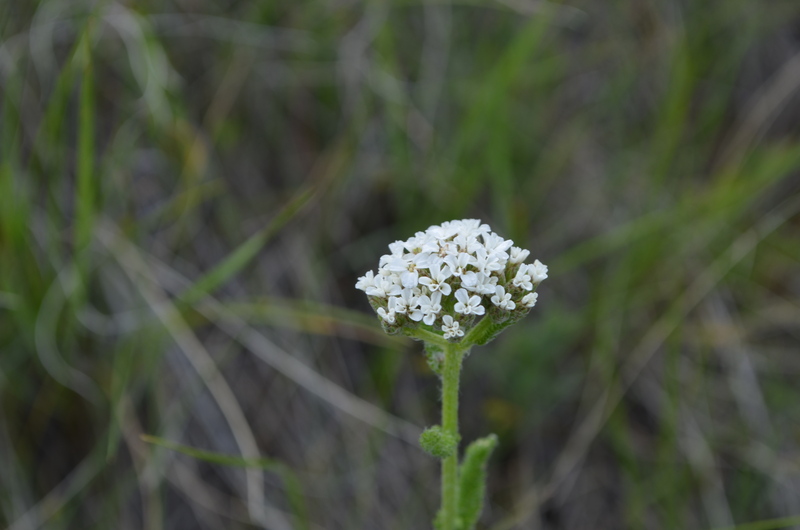 I saw some really nice flowers. 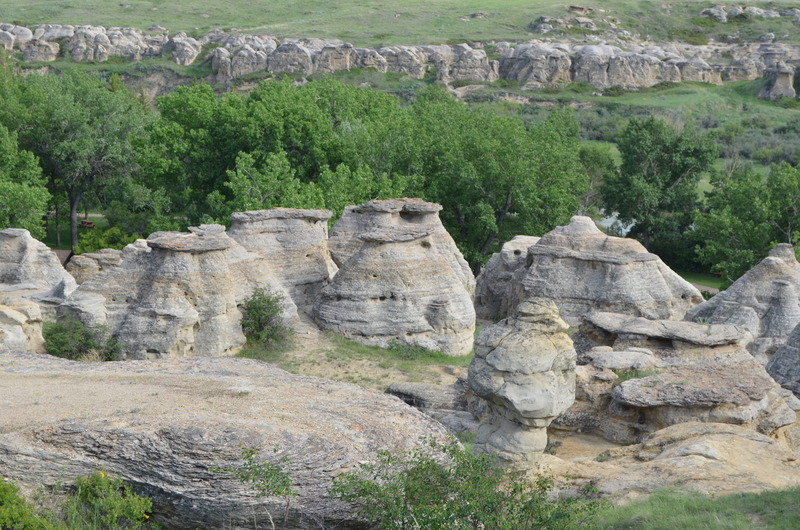 Plus some neat rock formations. 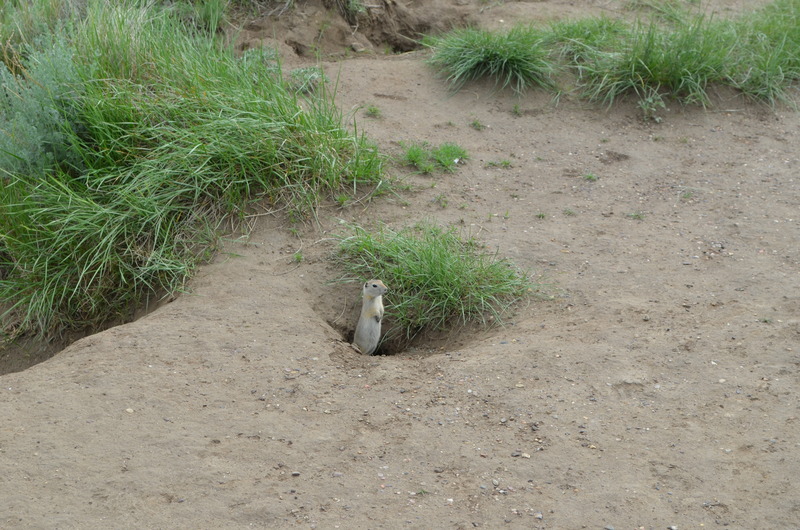 They have a motto at the prairie Provincial Parks that they “Brake For Snakes”. 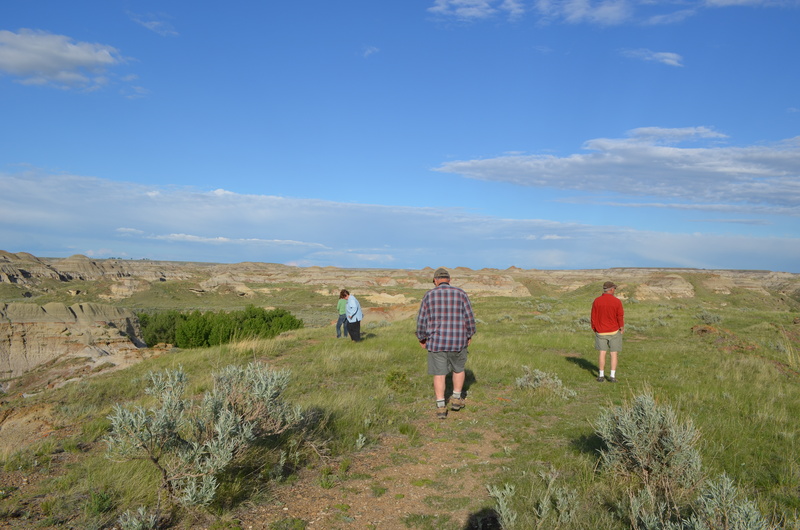 Our Indian guide explained to us that the prairie rattlesnake is becoming extinct. 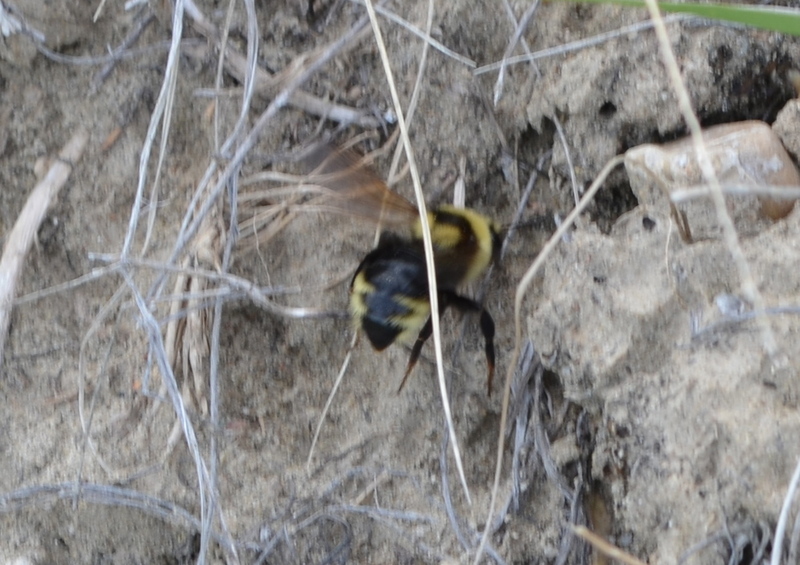 We were on a trail taking a lot of pics of the area when Linda spotted a big bumble bee. 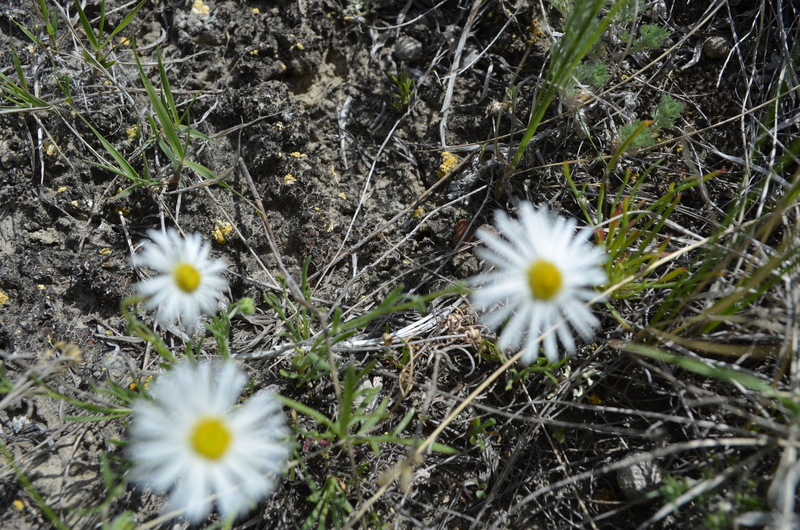 I was trying to get a pic of it so I stepped off the trail a few feet. I got this pic. As I was walking back to the trail I just happened to look down and this guy was napping about a foot from me. I was very lucky I didn’t step on it. It scared the you no what out of me. Then I got these two pics on the way back. This was a great day even though we were only spending one night there. 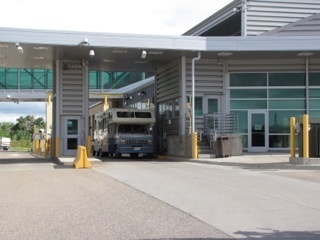 Tomorrow we will be crossing the border back to the good ole USA. 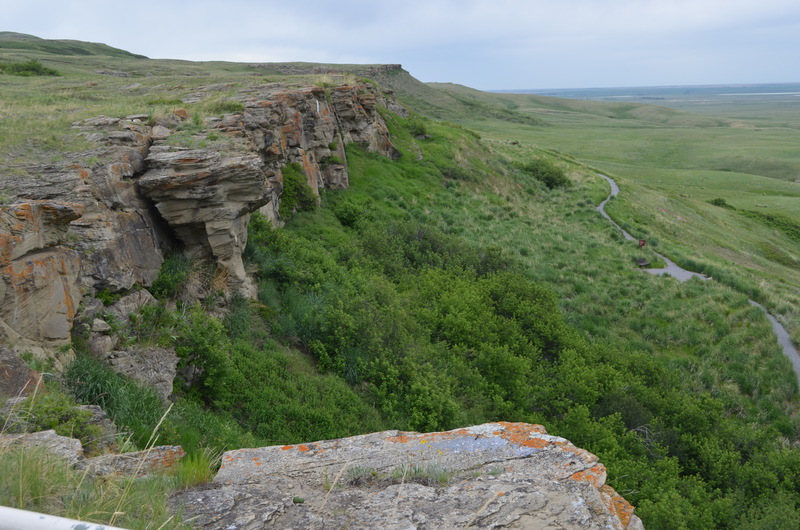 What is a buffalo jump? 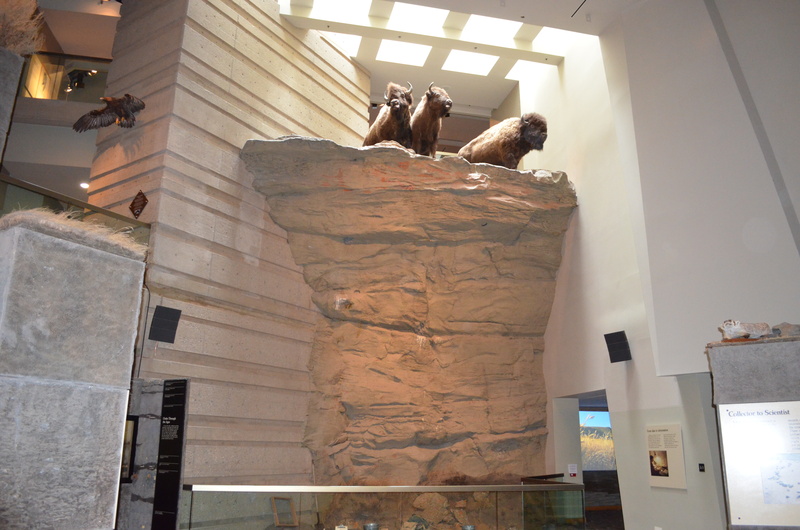 According to Wikipedia “A buffalo jump is a cliff formation which North American Indians historically used in order to hunt and kill plains bison in mass quantities”. 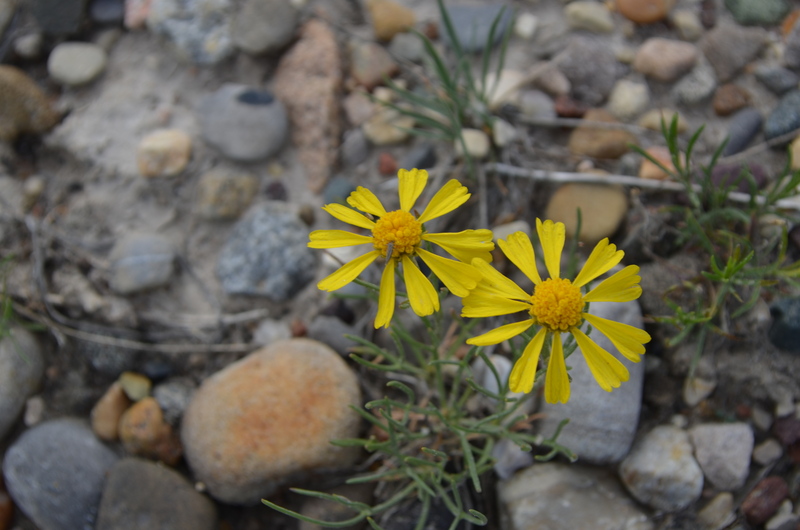 You can read more about them here. They have been going on for thousands of years by the Indians to procure buffalo to feed and clothe their people. 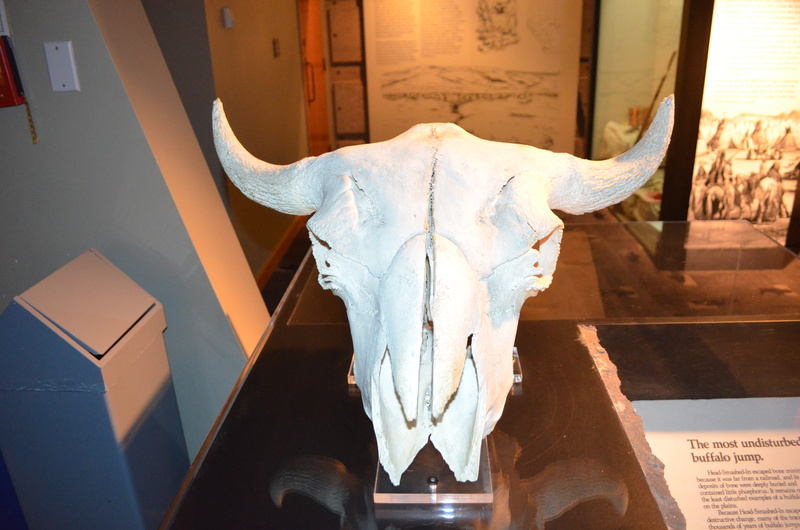 Probably the most famous buffalo jump was Head Smashed In Buffalo Jump, approximately 17 km from our campsite in Fort Macleod, AB. Every one in our group went there to go on the tour. 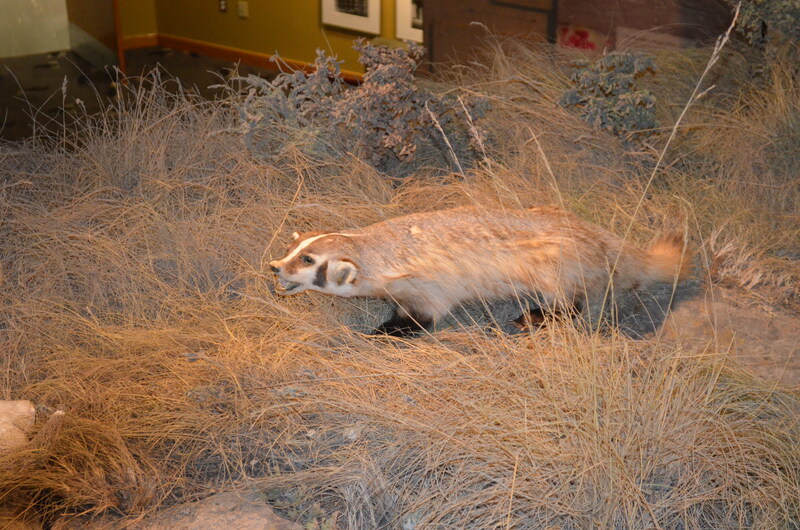 They also had many other beautiful stuffed animals as well. 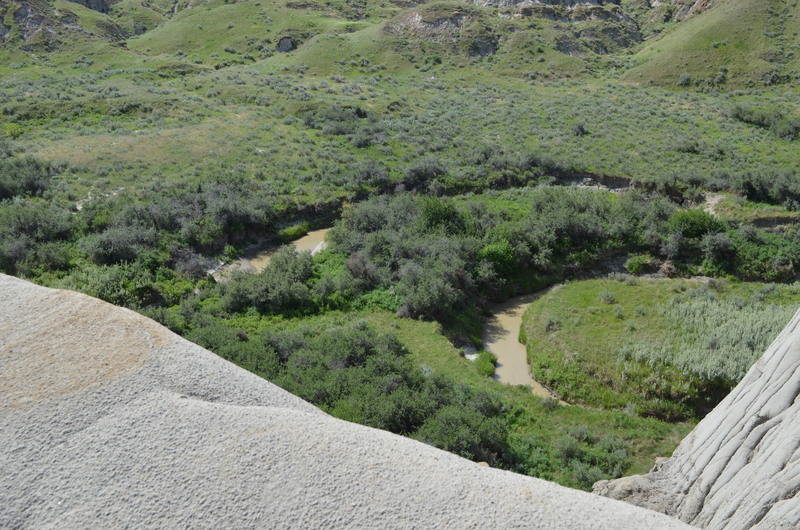 This is the actual buffalo jump used for many many years. 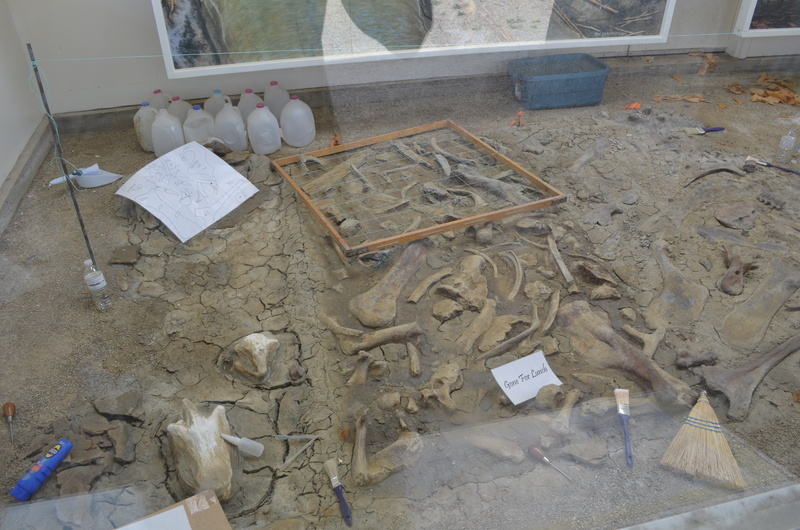 Archeologists had dug up bones and artifacts that went back several thousand years. 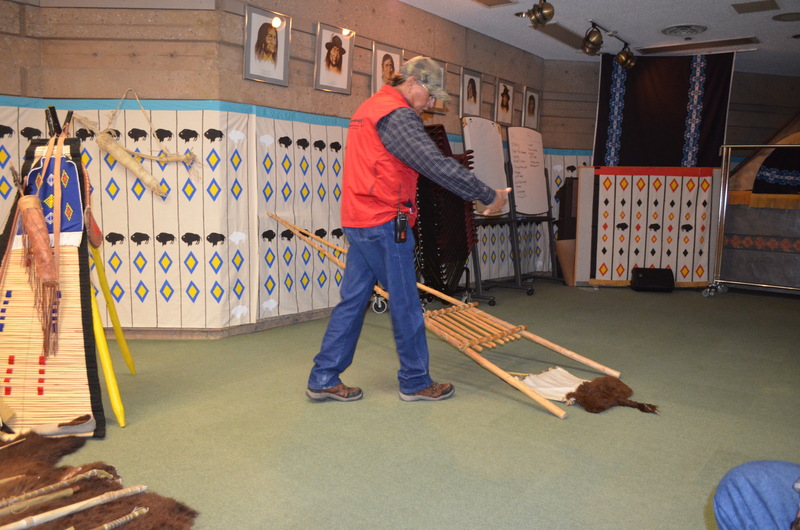 Several of us were invited into a special room by Edwin who is a Blackfoot Indian. He then showed us this display and asked us to point out different items. 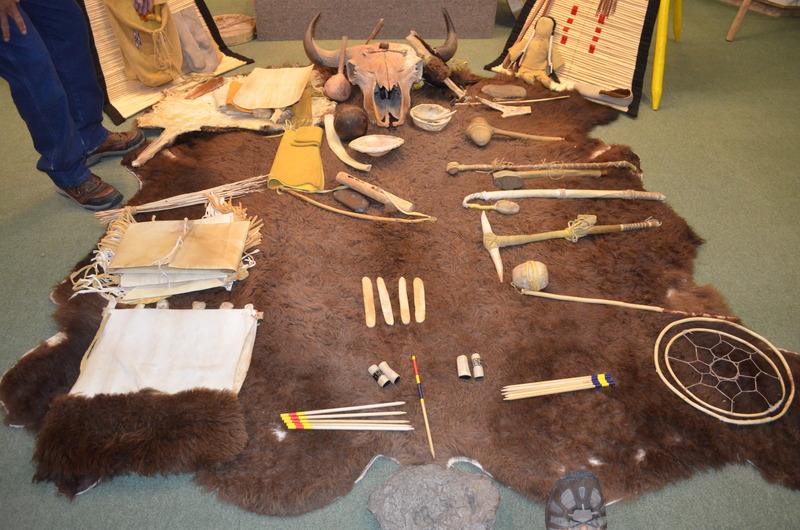 He would then explain what they were and what they meant and how they were used by the Blackfoot Indians. Here is Edwin showing us how they carried heavy items by using their dogs. Here he is explaining how they drilled holes. 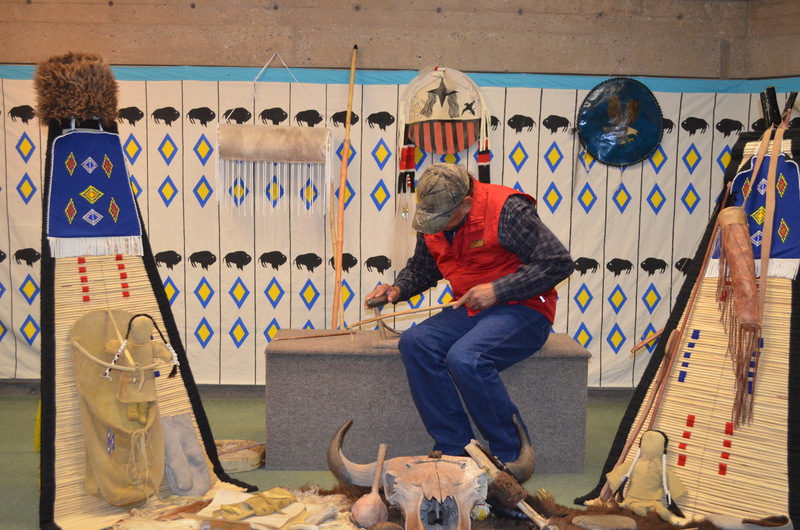 It was really interesting because he also talked about the life of the Blackfoot Indian and many of their rituals. 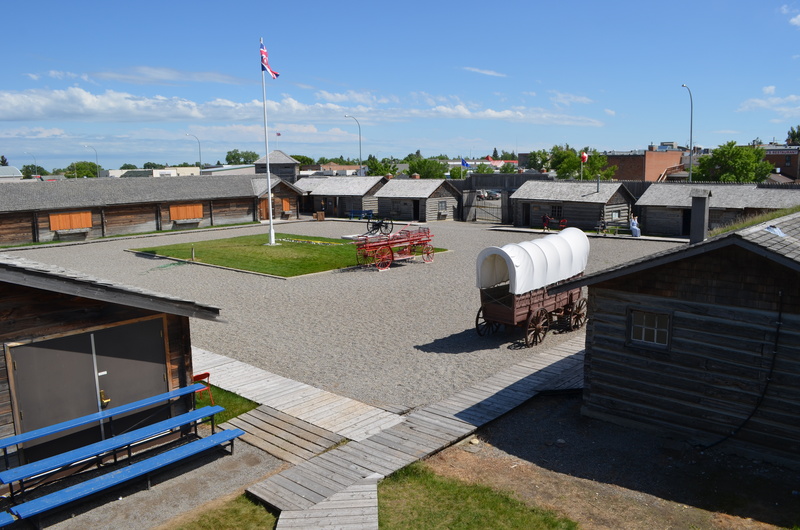 I also decided to visit Fort Macleod. 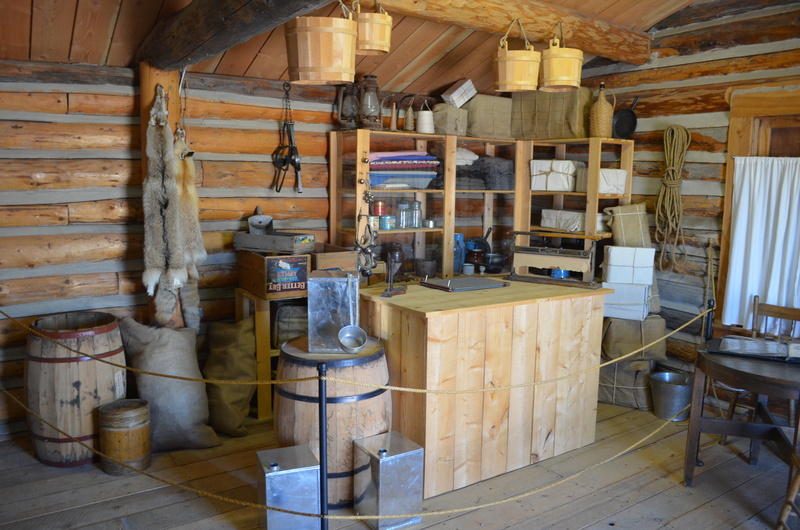 It too was very interesting but had to do primarily with the Royal Canadian Mounted Police. This was a traders storefront. 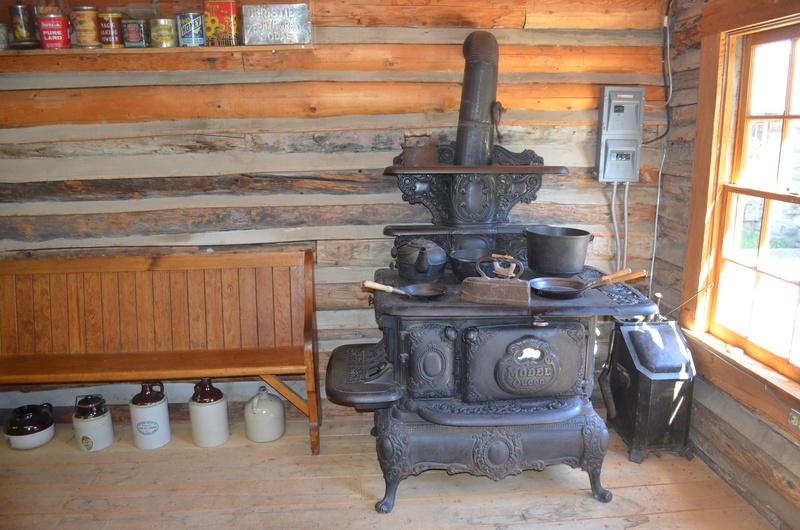 A very old wood oven of the 1800’s. 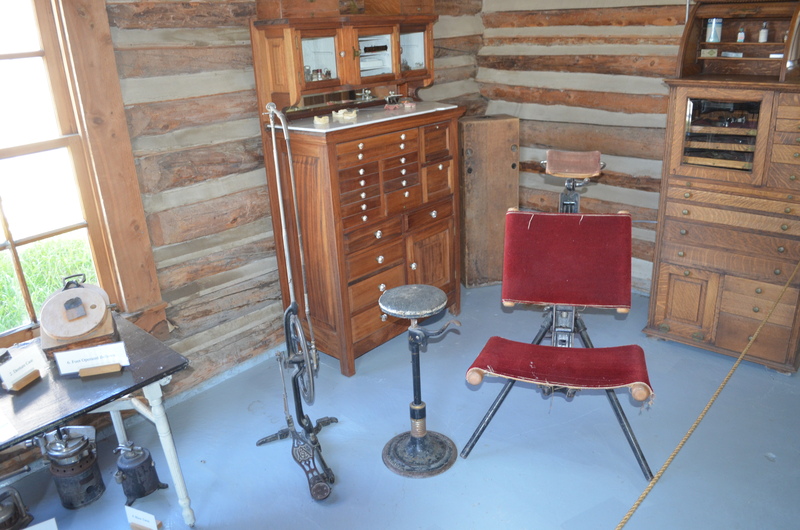 A dentist’s chair. I don’t think many people went to the dentist back then. Here is a doctor’s office including an incubator. 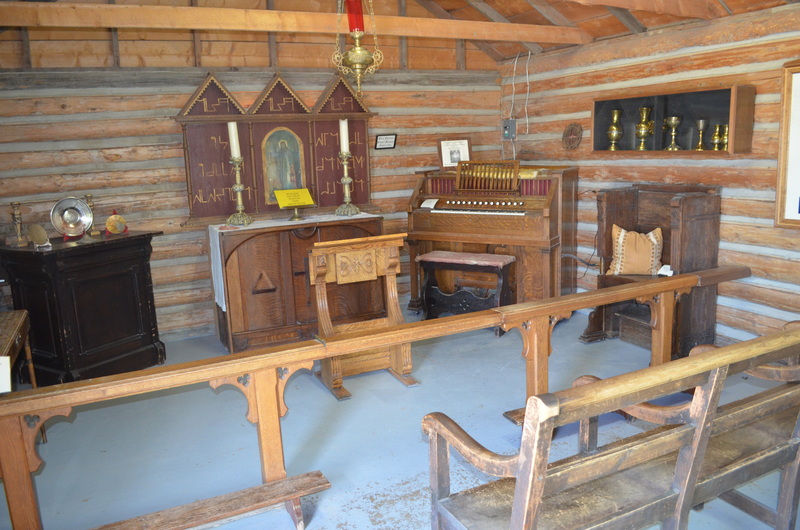 Here is the chapel used at the fort. They were probably praying they would not get attacked by Indians. I the walked over to Main Street. This is a very old town and had many interesting storefronts. 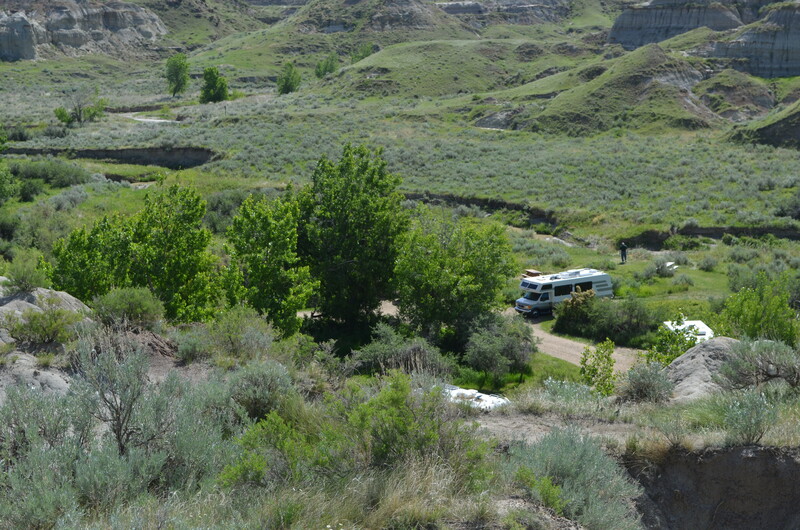 We had great camp sites at the Daisy Mae campground. 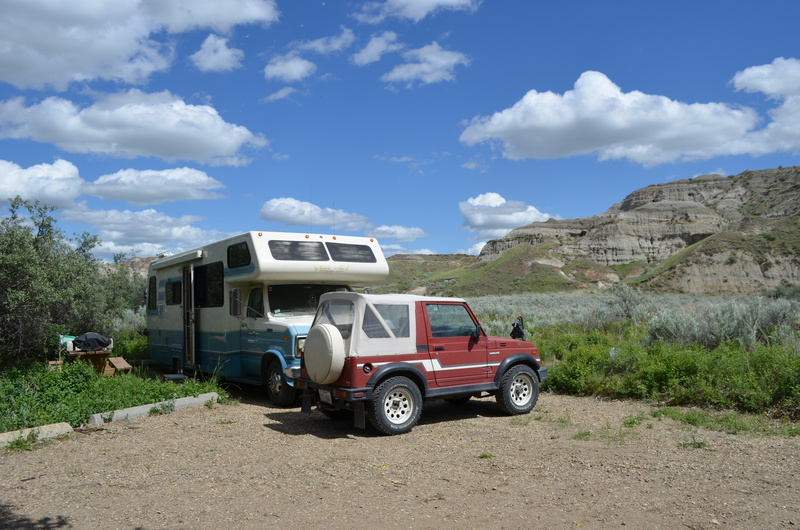 The owners were very friendly and we were all nestled in together. This was my camp site. 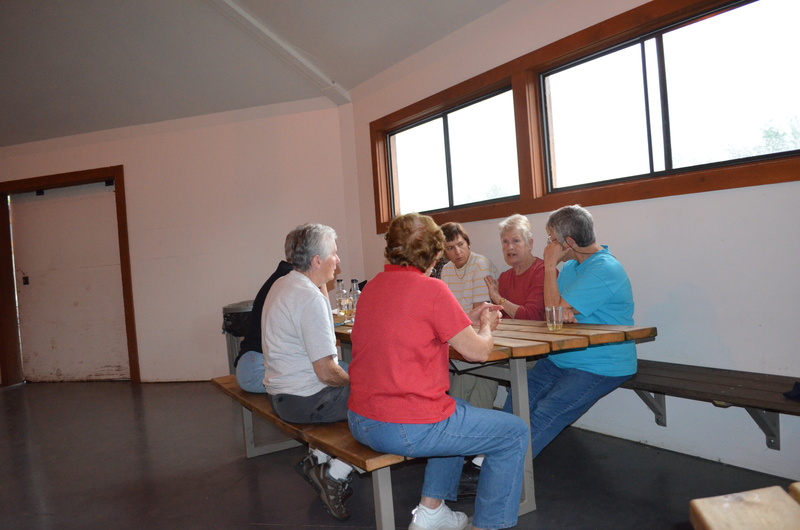 The second night we were there turned out to be a great day as the weather was perfect so we had a potluck. There was a lot of great food. 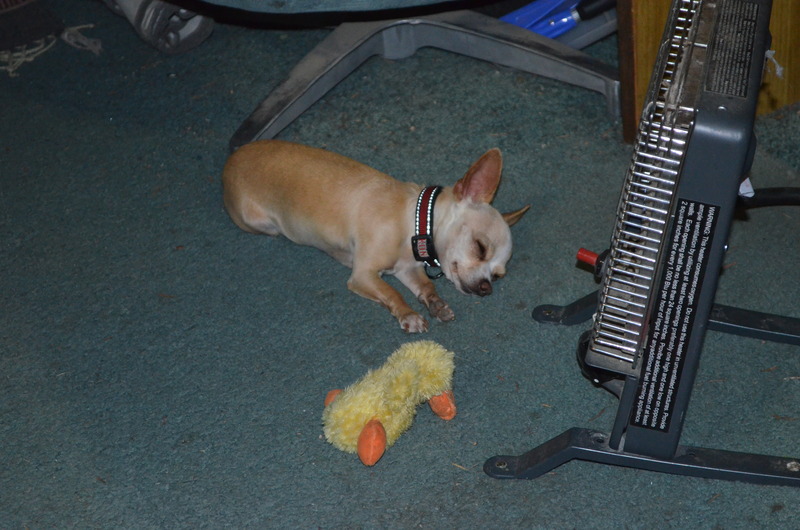 Chica stays nice and comfy. For all you Chica fans out there this is how she stays nice and warm. Right next to my Wave 3 heater. She loves it right next to her ducky. We drove 166 miles to stay at our next spot. The day started out with a light shower but ended with beautiful sunshine. 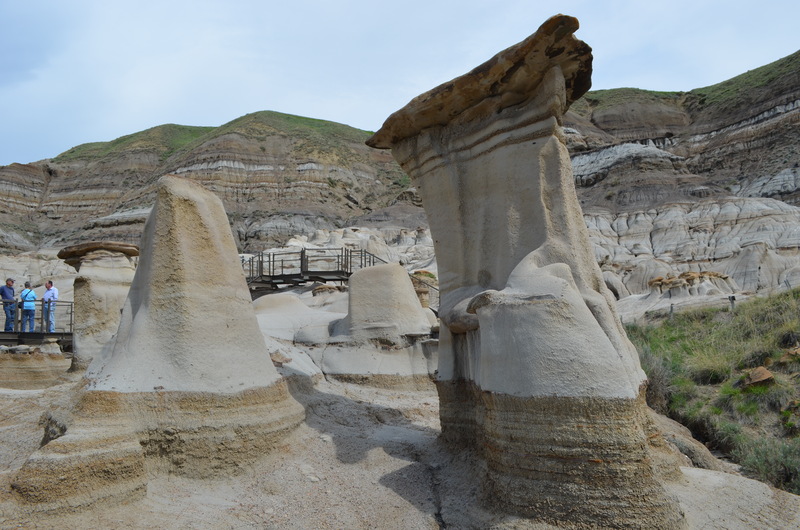 Our destination was the Dinosaur Provincial Park about 45km from the small town of Brooks, AB. Most of us arrived about 1:00pm and waited in their parking lot. We were told we could not go into the camping area until 2:00pm, when the other campers were supposed to leave. At 2:00pm we all caravanned into the group camping area we were assigned, but unfortunately the previous campers had not left. In fact they weren’t even ready to leave. We called the ranger and he notified them that they were supposed to leave. It took us another hour for them to leave and us to finally get settled in. 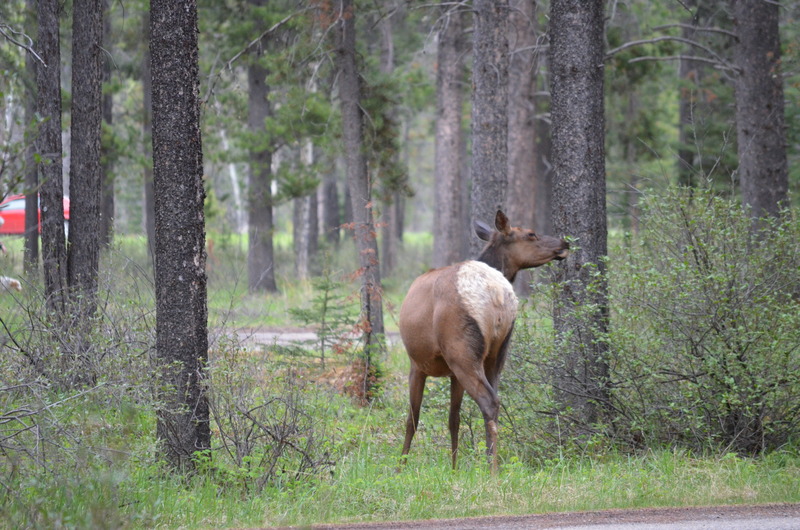 If any of you are planning on staying at an Alberta Provincial Park I would suggest that you not even get there until 4:00pm. 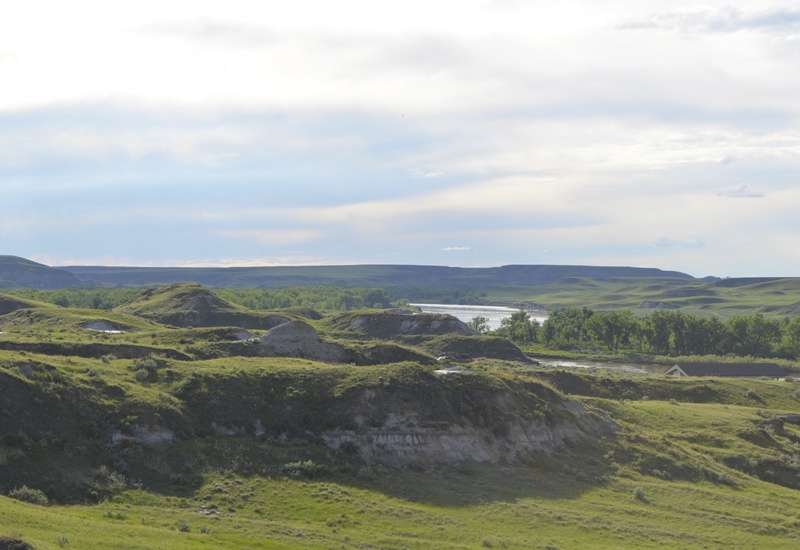 I have a beautiful site with lots of sun for the solar panels and the Badlands in the distance. Chica and I were napping in the afternoon when Linda came pounding on the door telling me to come out and check something out. It was John and he was on a very high spot overlooking our campground. I hurriedly grabbed my camera and we both hiked up to meet John. This was our view from up there. 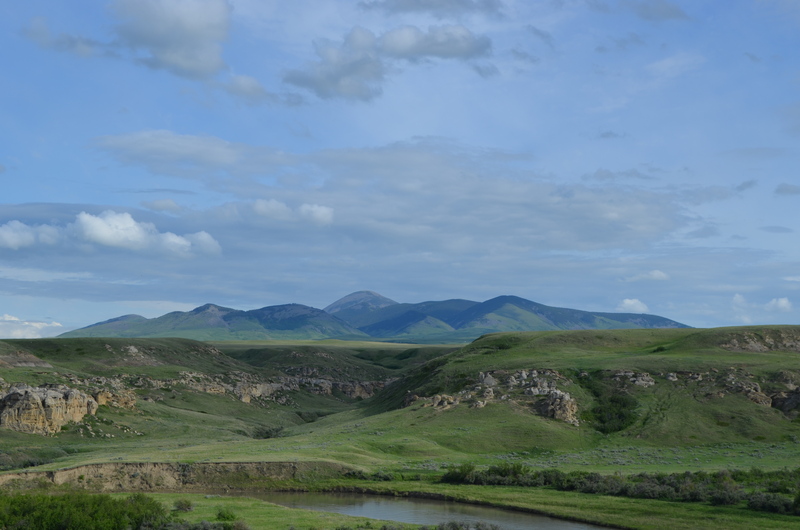 This is the plateau we were on. And this is a pic of the river. 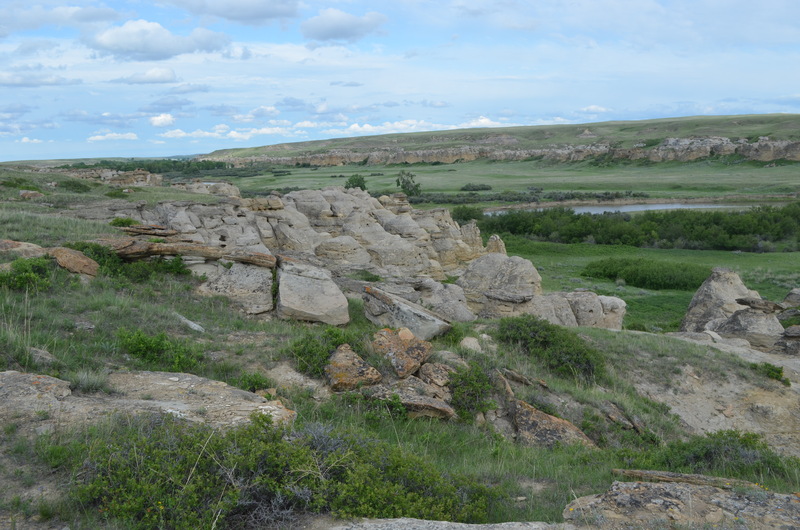 The trail we were hiking is called the Coulee Viewpoint Trail. It is only .9km long, but climbs to ridge tops with beautiful views. 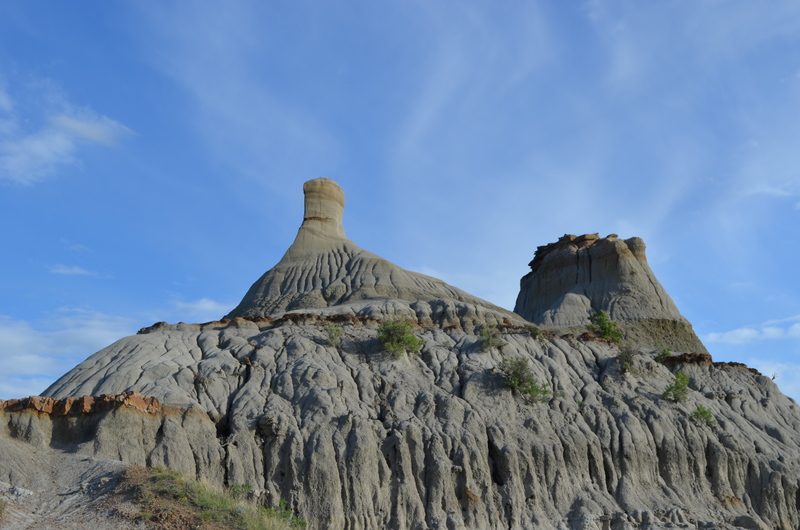 We even saw some hoodoos. Since it was late in the day we decided to come back in the morning and hike the remainder of the trail. Again we had spectacular views. 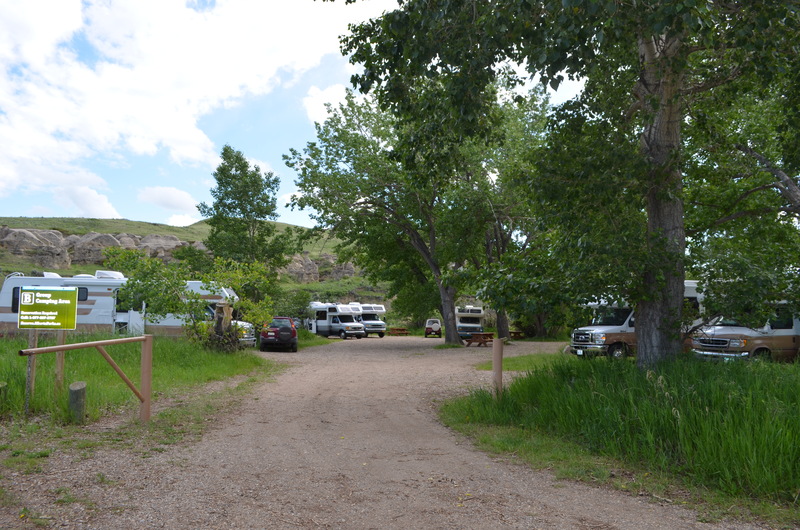 Here is a pic of the river as it winds it’s way through the campground. 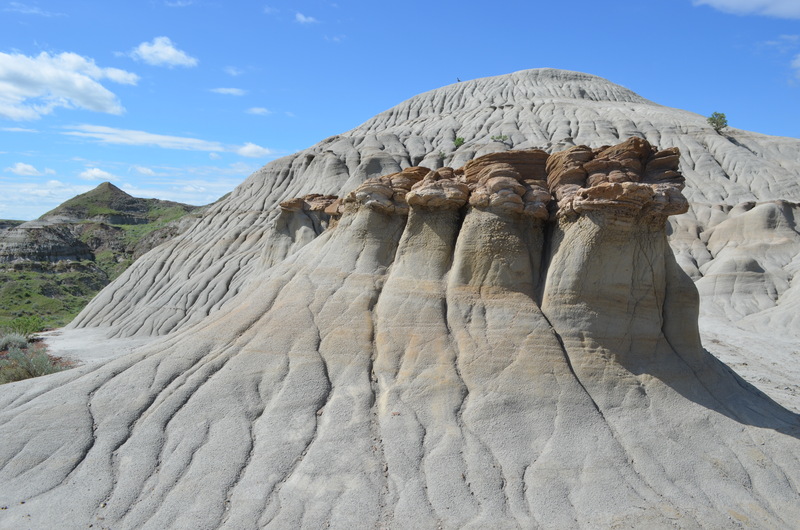 Hiking among beautiful rock formations. 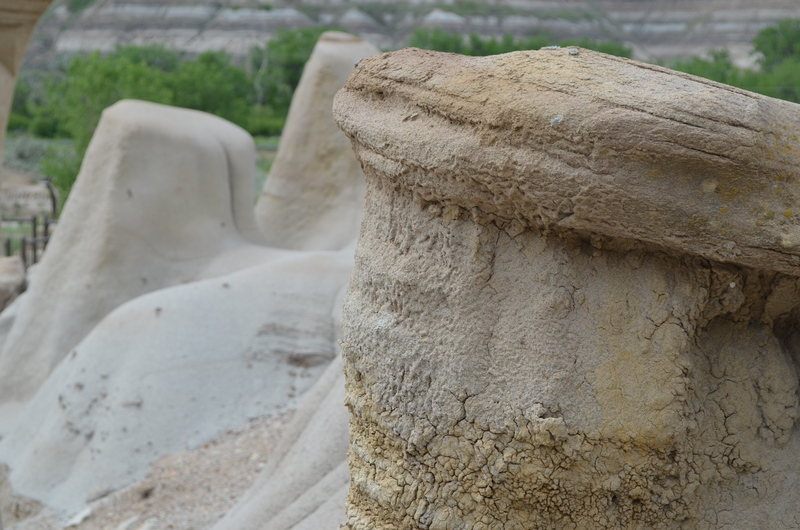 The rock formations were really great! 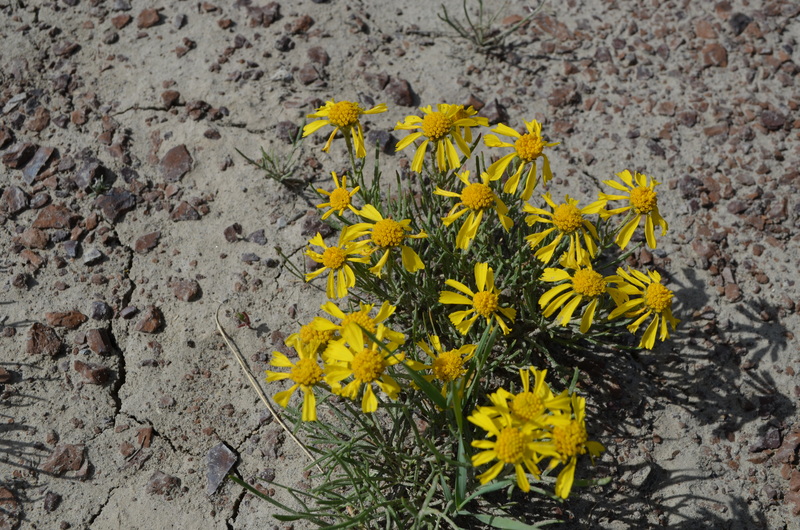 Several different types of flowers were in bloom. 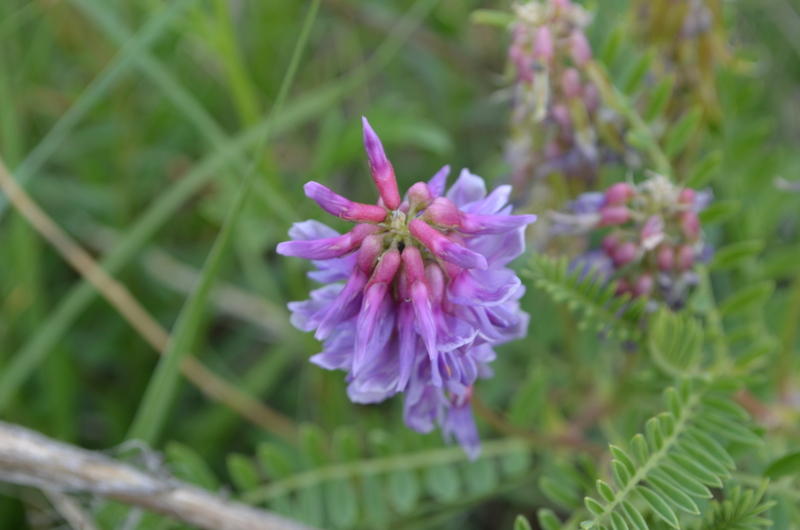 These pics are a bit out of focus because of the wind blowing at the time. 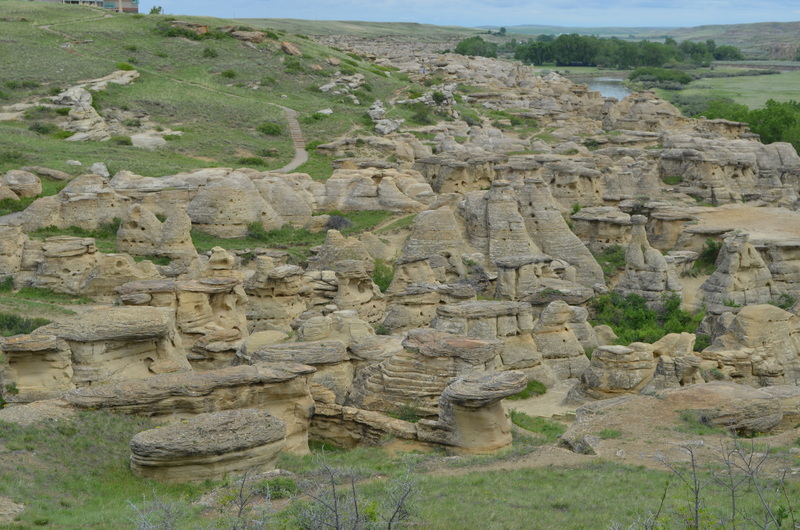 Later John and I hopped in the car and drove a loop trail that wound through the Badlands. 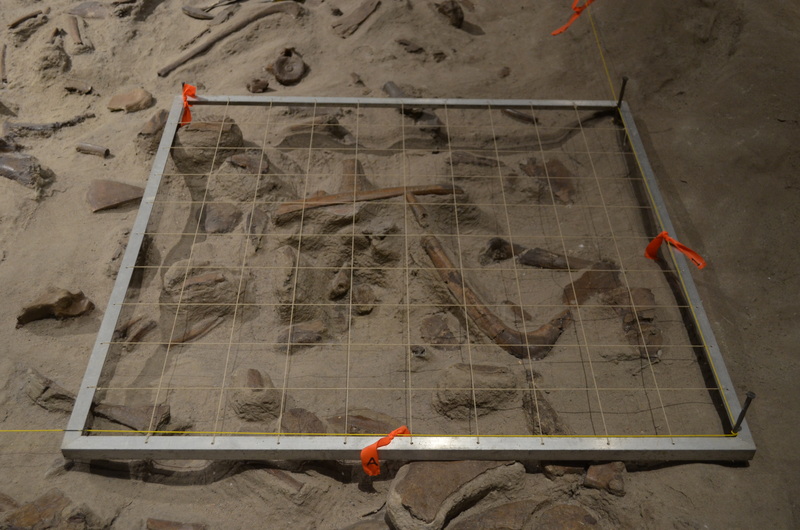 They had displays of bone beds where the dinosaurs were actually found and left. 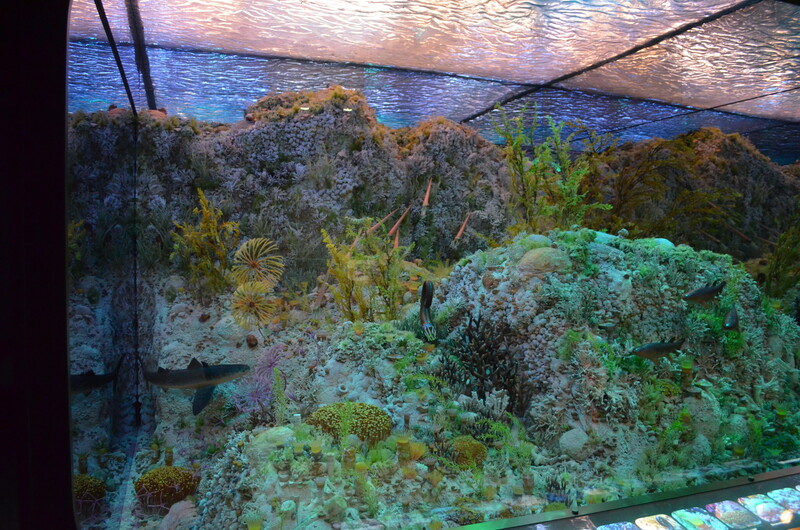 They enclosed them in a glass house so you can look in and see them. 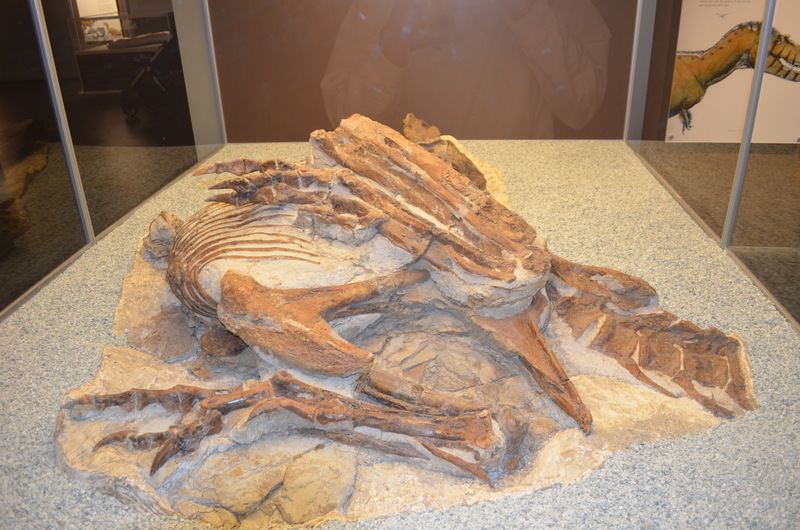 It was neat to see them in the original state as they found them. I have never truly been interested in dinosaurs that much and I probably didn’t get much more information then watching the movie Jurassic Park. But these last 4 days have really peaked my interest. 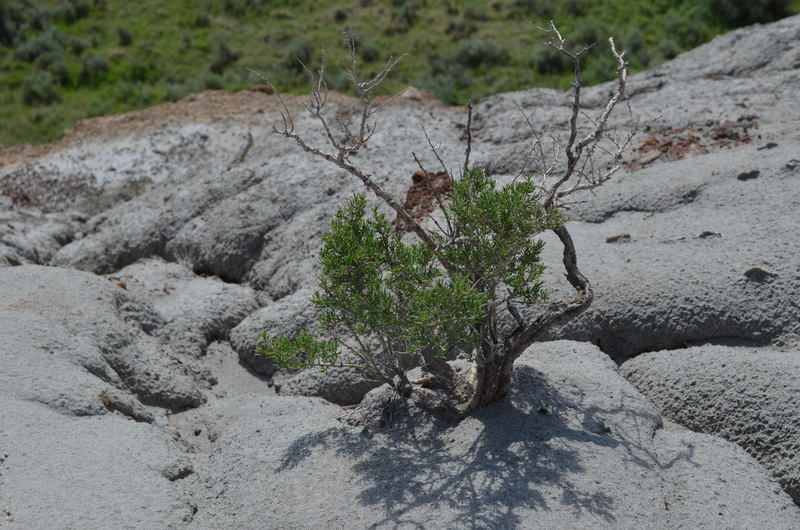 Being able to travel through this area known to have many dinosaur fossil grounds was really something. I know these pics do not really do it justice, as you really have to been here to see the scope of it all. But I hope you also were able to enjoy them as well. 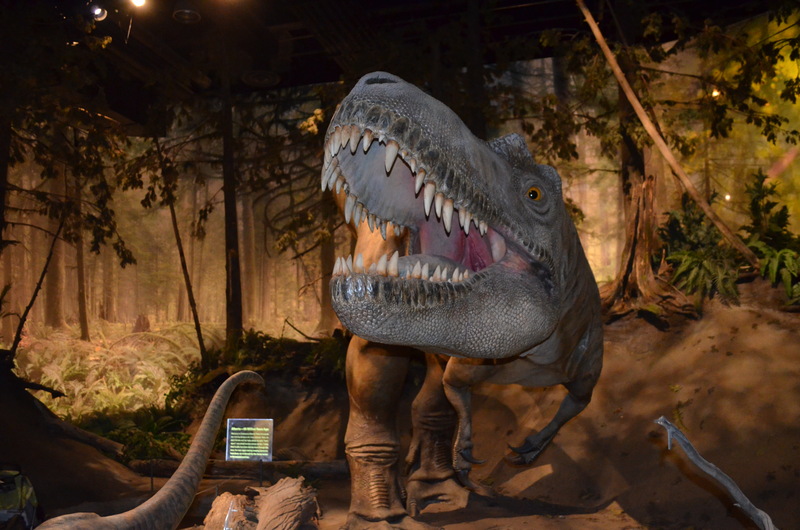 If you are ever in the Drumheller area you MUST see the Royal Tyrrell Dinosaur Museum. Don’t expect to get through this in just an hour or two. It is huge and would take several days if you were to stop and read all the signage. It was Senior Week in Canada and since I am an old fart I got in for nothing. That’s right! Nadda! That made it even better. 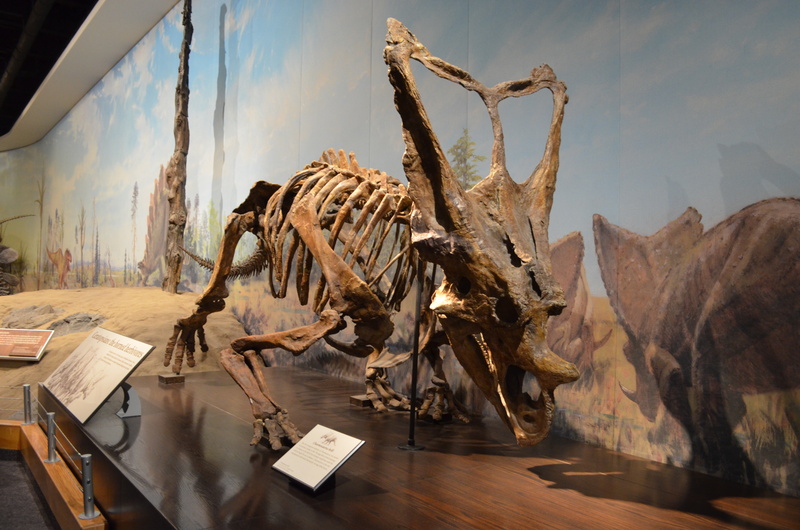 The first thing that greets you when you enter the displays are these guys. 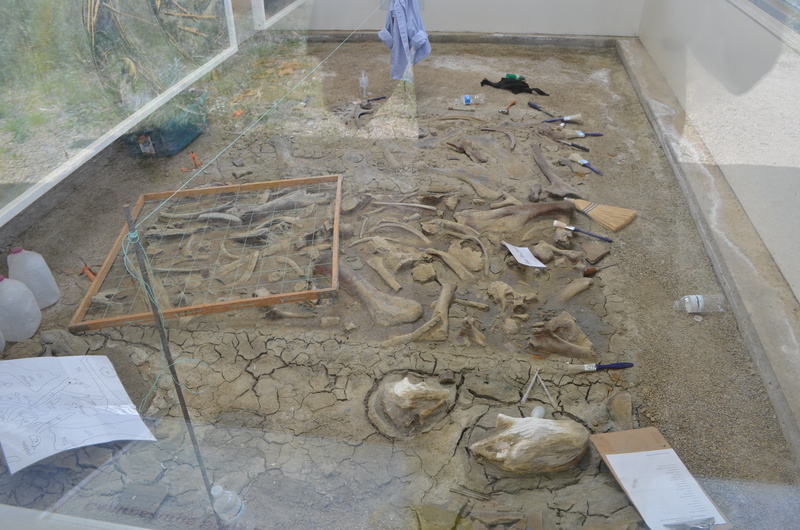 Then they show you how dinosaur fossils are found. 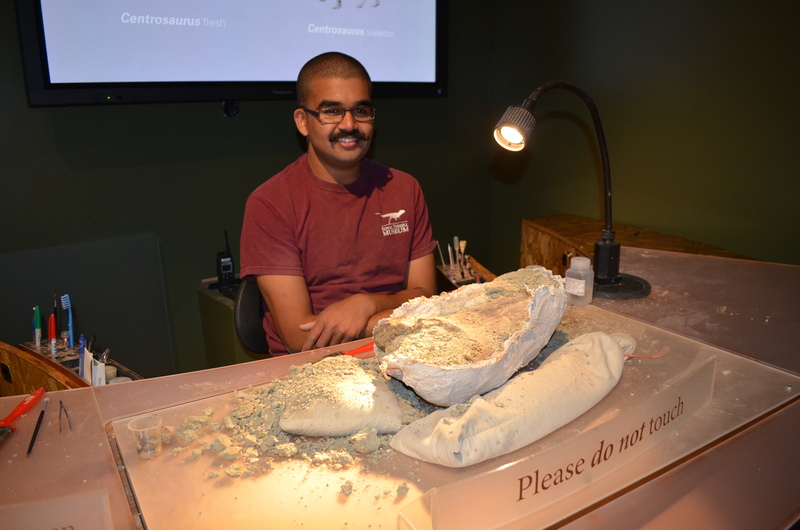 This was an employee who showed us the meticulous job of chipping away at the rock that was surrounding the fossil to finally expose the bone. He used a very small tool and it takes extraordinary patience. 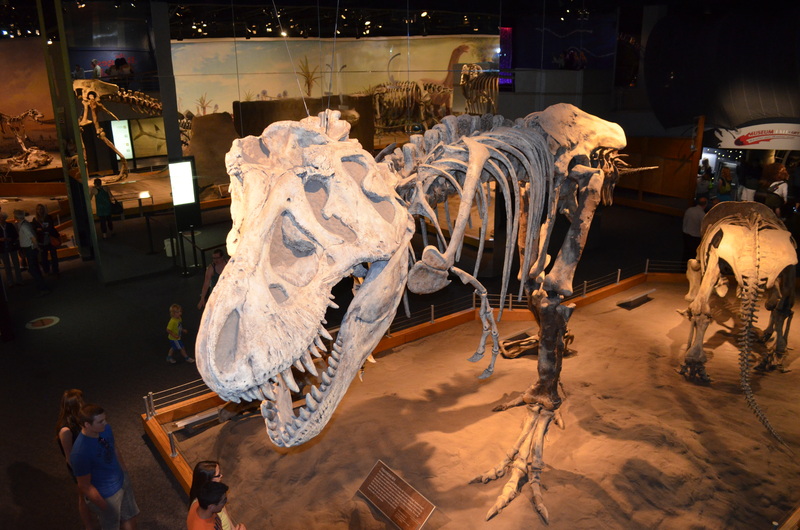 This is the dinosaur hall where you will see actual dinosaur skeletons assembled as they really are. 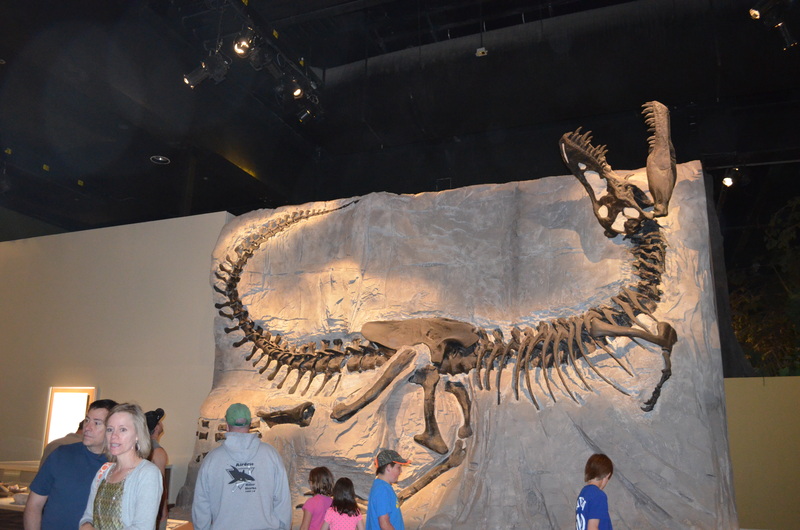 It was a fantastic site and there were many different dinosaur types from many different ages. 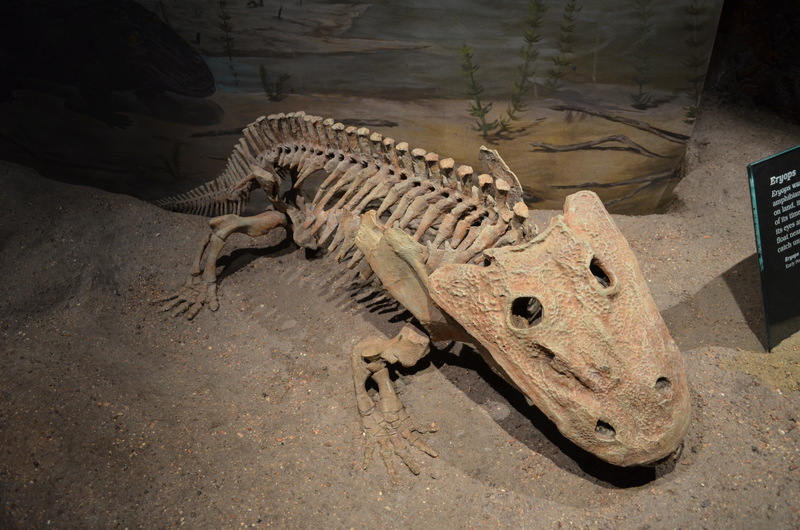 All these were found in the Drumheller area of Alberta. 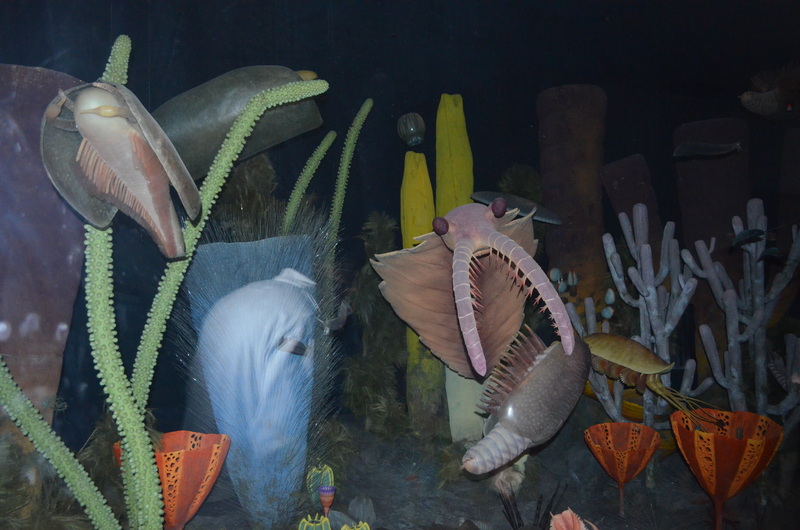 There was even an undersea dinosaur display. 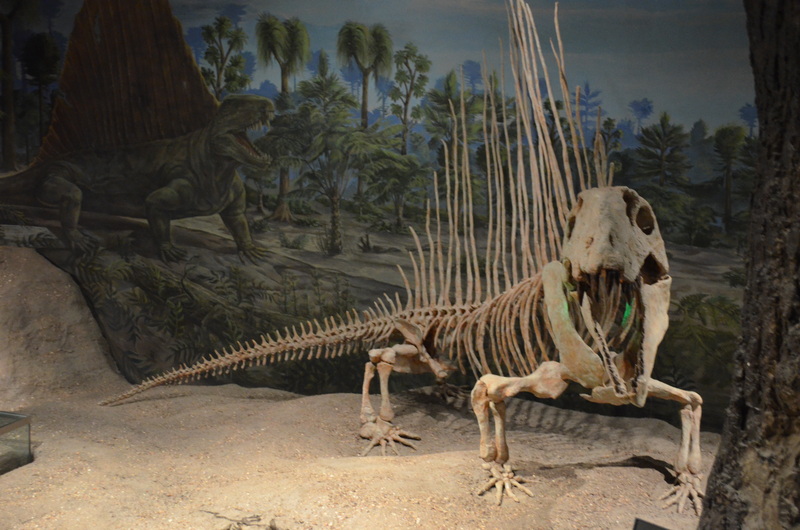 There were many more on display in the Dinosaur Hall. 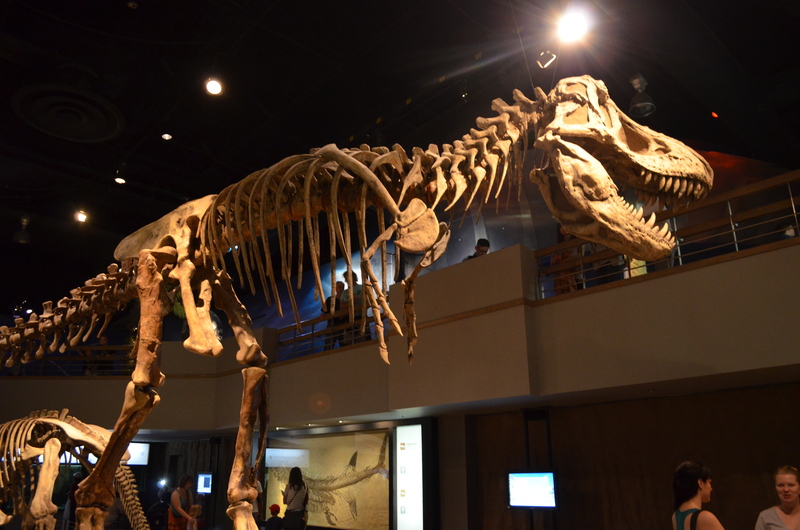 The Tyranosaurous Rex display was particularly interesting. 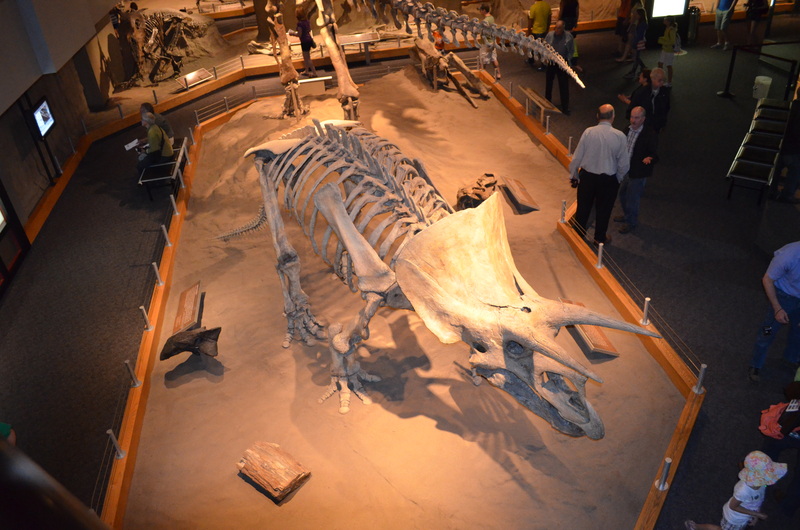 The hip bones were lying on the floor since they had such enormous weight they could not hang them. 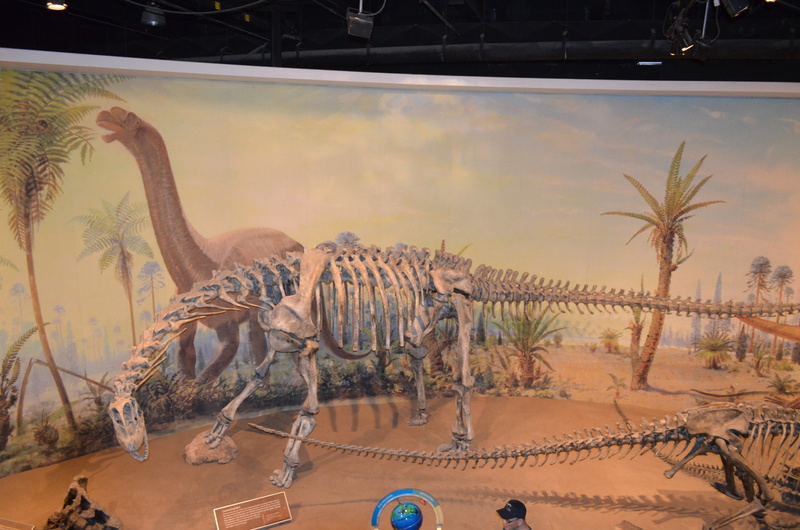 Instead they recreated a hip bone that was used instead. 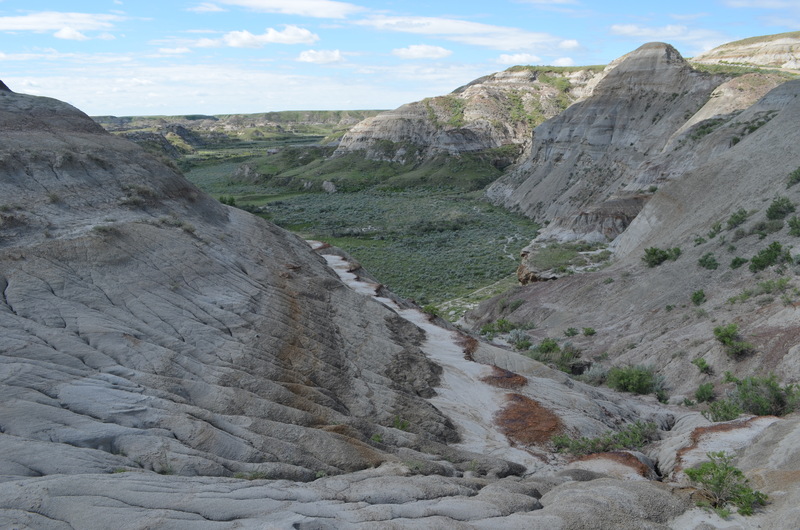 This is a pic of a bonebed much like how the bones are actually discovered. 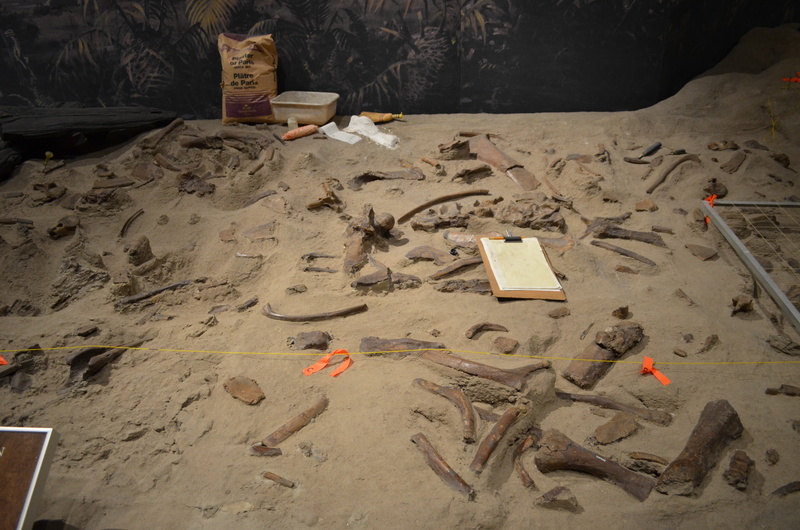 They map out the entire area before actually removing the bones. Aside from the Smithsonian Institute in Washington DC, this has to go down as one of the finest exhibits I have ever seen. As I mentioned previously it is a MUST see. 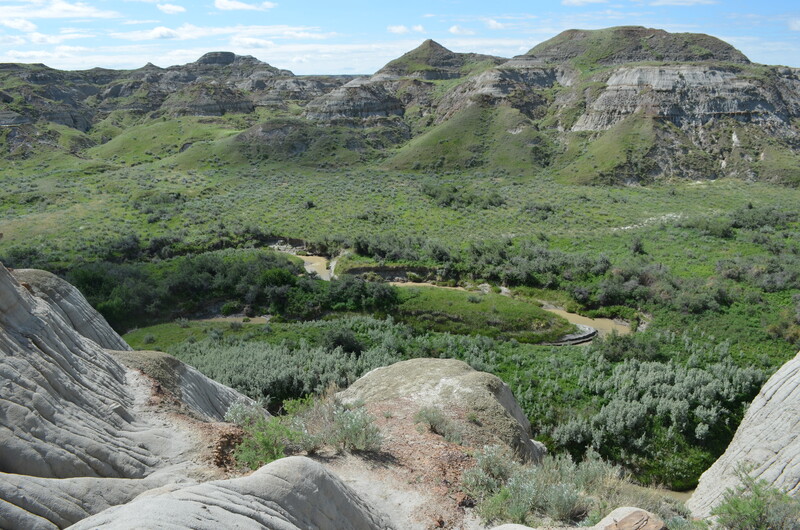 Our next stop on our fabulous tour through Alberta was Drumheller, AB. Prior to this trip I had never heard of this town. 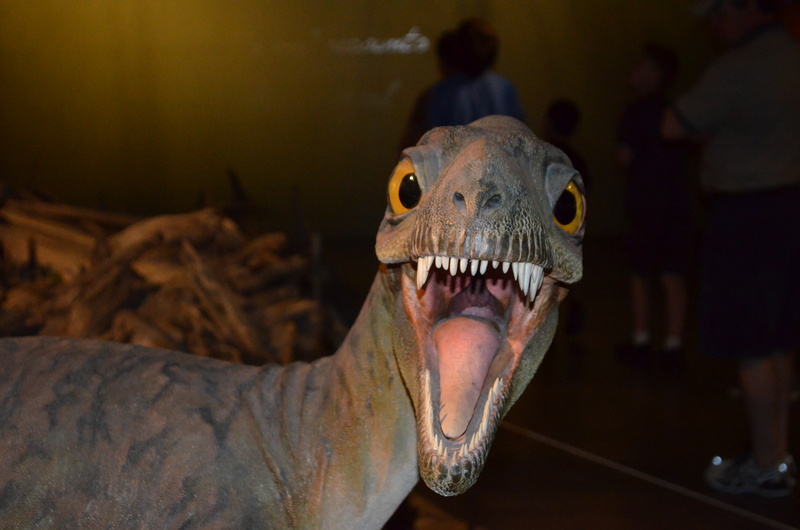 But anyone who has studied dinosaurs is sure to know of it’s existence. 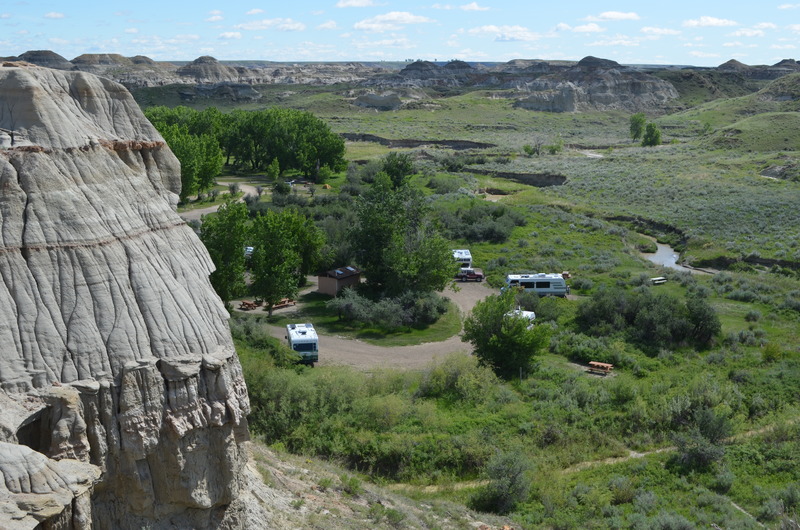 We were camped at the Dinosuar RV Park within walking distance to the entire town. It was a nice campground with plenty of washers and dryers. Here is a pic of my site. 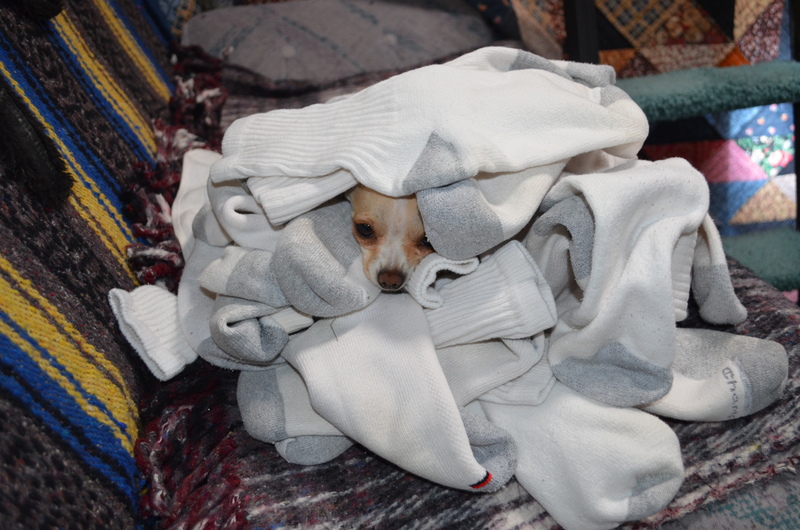 We are going to be here 3 nights so we had time to do the laundry as well as relax.. Chica offered to help me with the wash, but I couldn’t get here to fold the socks. The first full day we were here many of us decided to go on a tour of the area, which was offered by the RV Park for $25. 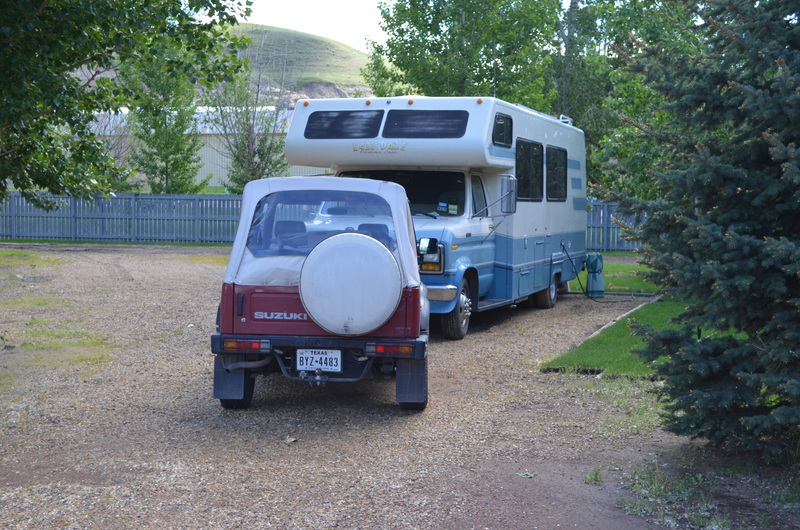 They had a bus that carried us to many unusual sites in the area. Our guide had lived here most of his life so could answer our many questions. 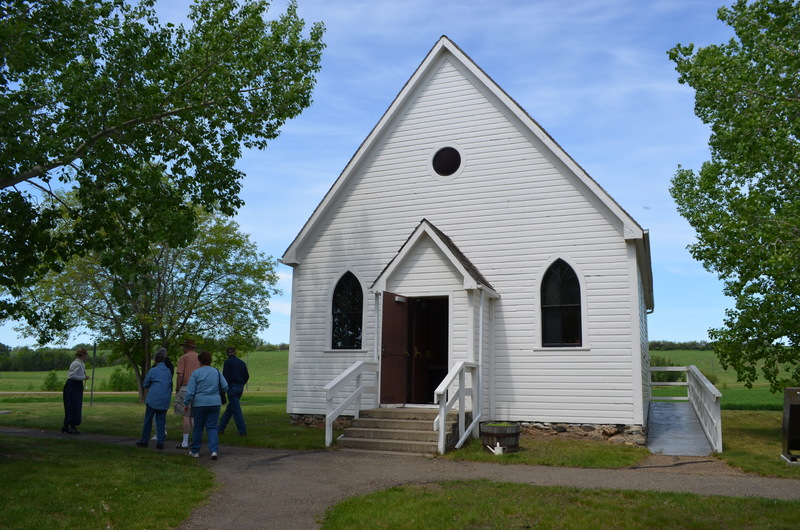 Our first stop was Drumheller’s Little Church. It would seat 10,000 people but only 6 at a time. 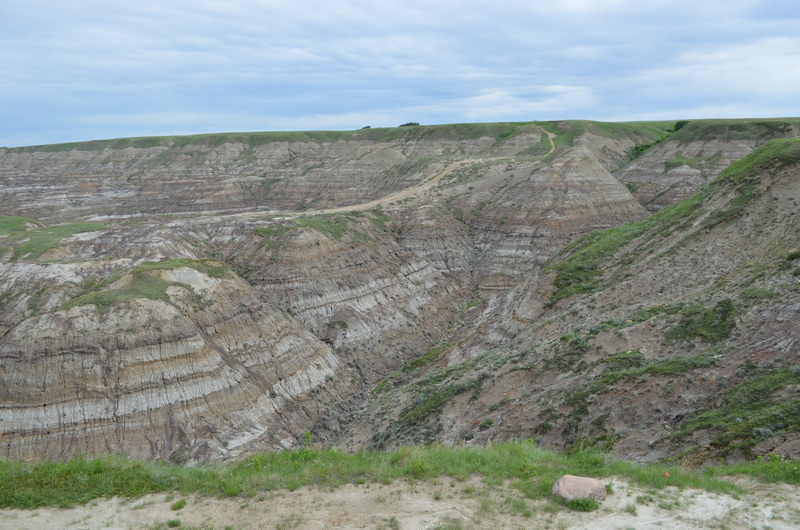 The next stop on our tour took us to Horse Thief Canyon where a local tour guide met us. 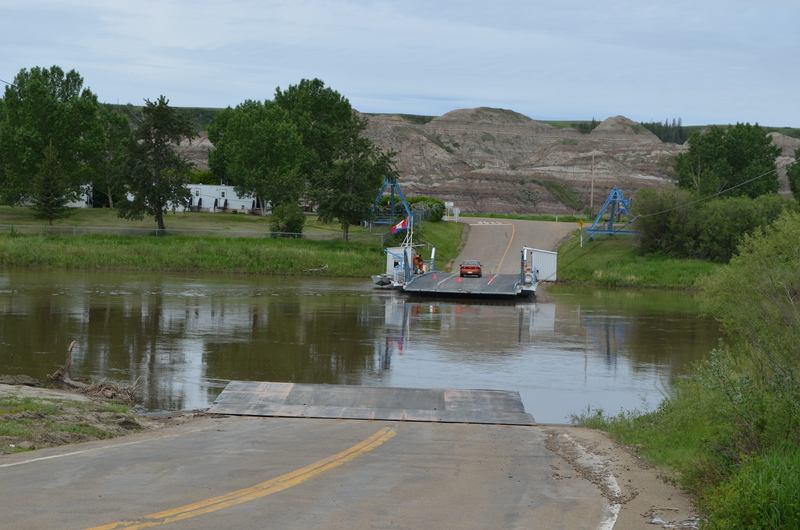 Then we crossed the Red Deer River on the Bleriot Ferry. It was named after Andre Bleriot who homesteaded here around 1904. 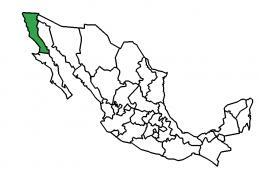 A homesteader could buy 160 acres for only $10. I sure wish you could do that now. What a bargain!!! 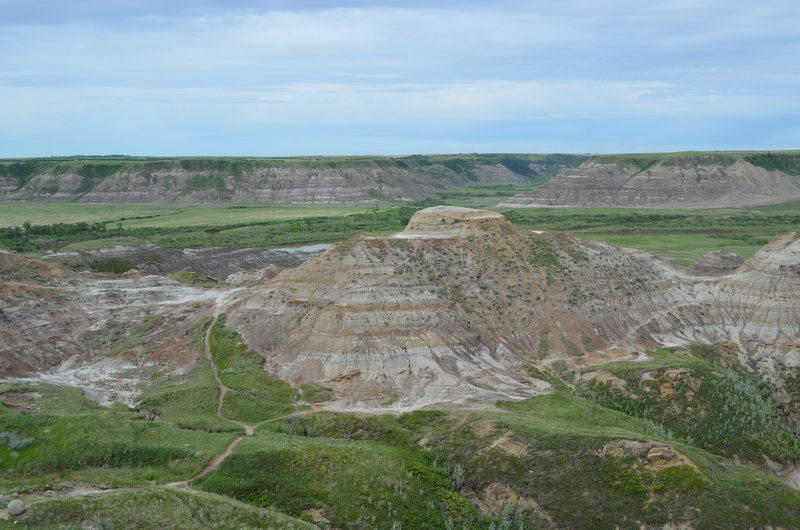 Then we proceeded to an overlook of the Red River Valley. What a view! 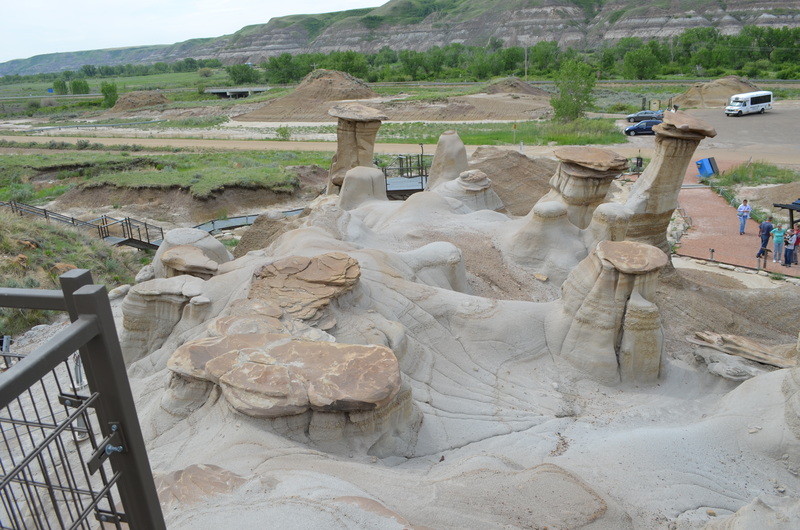 Then we traveled through Drumheller to the other side of town where we saw a fantastic display of hoodoos. You could walk among them and see them up close. 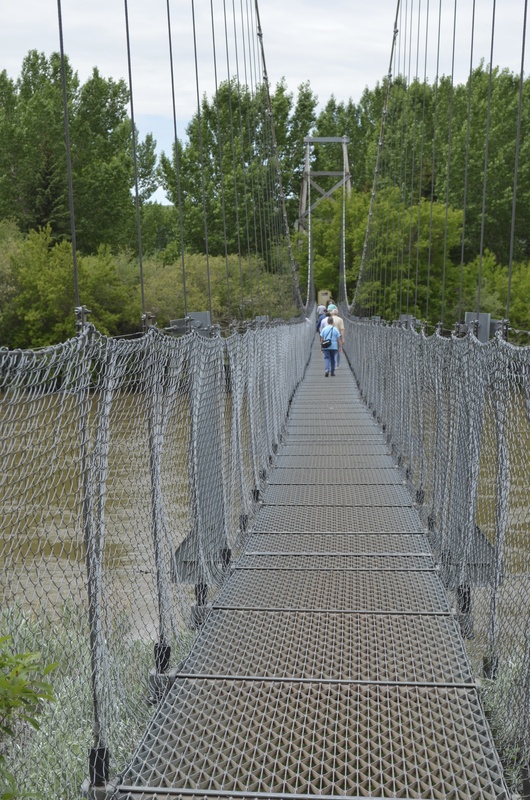 We then all hopped back in the bus and drove to the Star Mine Suspension Bridge. 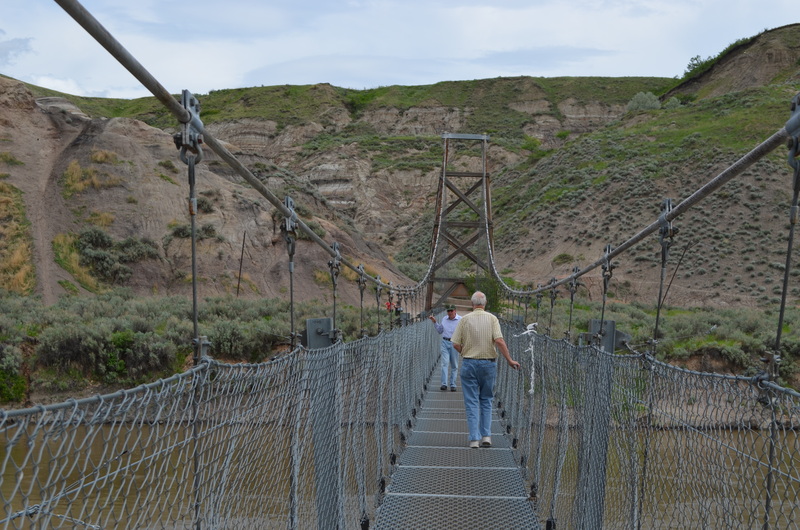 Miners used this bridge to get to the other side of the Red River and the coal mine . 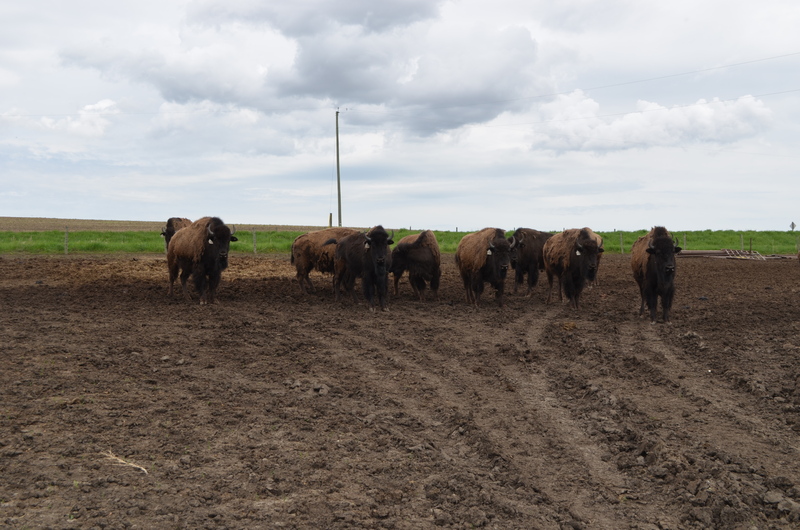 The last stop on our tour was at a ranch that raised buffalo. 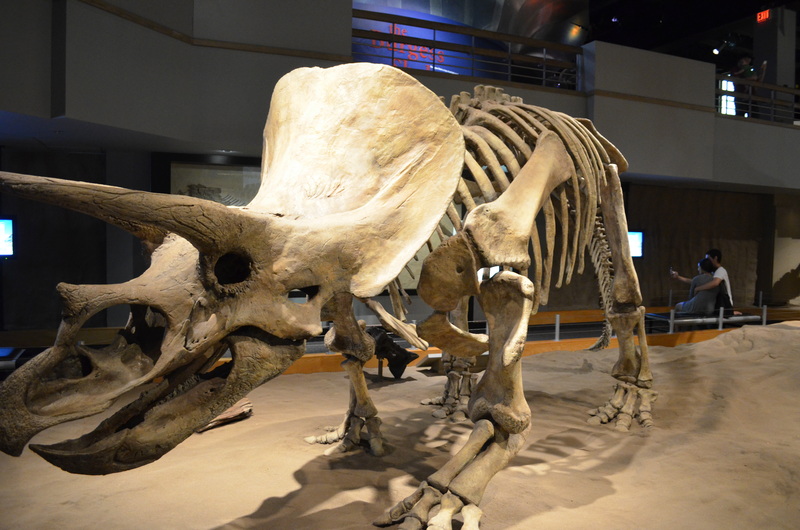 These were the females approximately 2 years old weighing approximately 850 lbs. 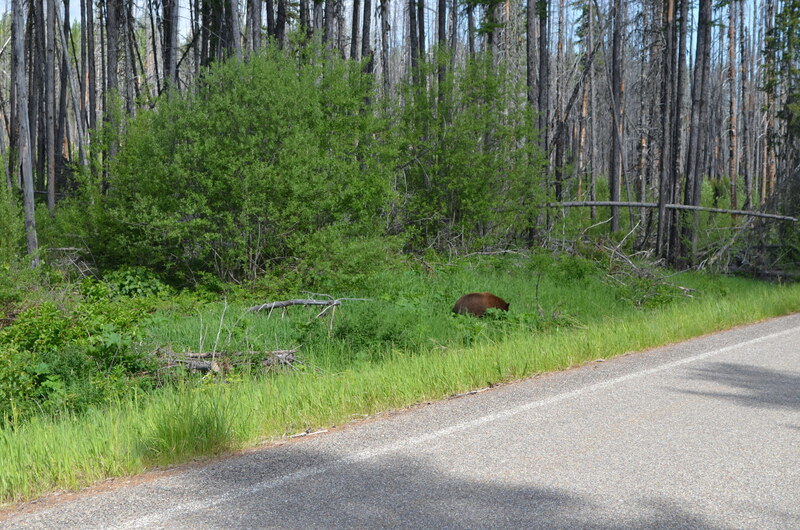 They were very curios as you can see and started walking toward us. They are probably saying to each other, “humans have to be the weirdest thing I have ever seen”. They walk on their hind legs and talk way too much. 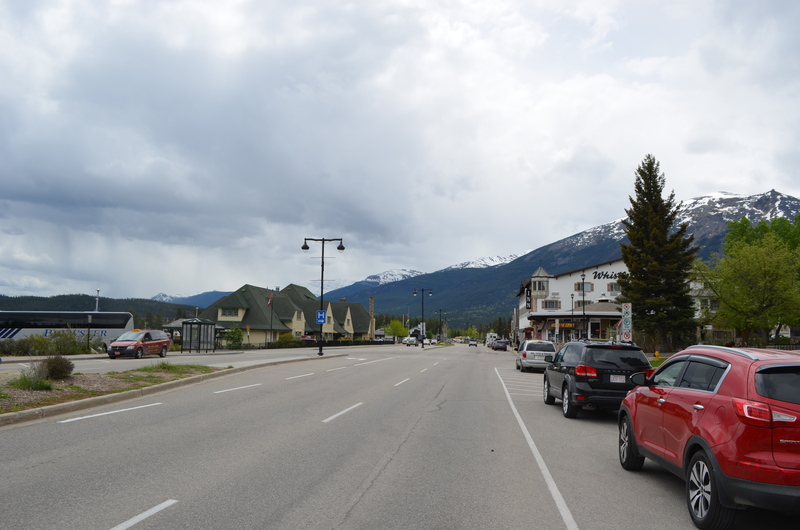 Jasper is a great little town all nestled in the Rockies. It finally stopped raining and we had a great couple of days there. 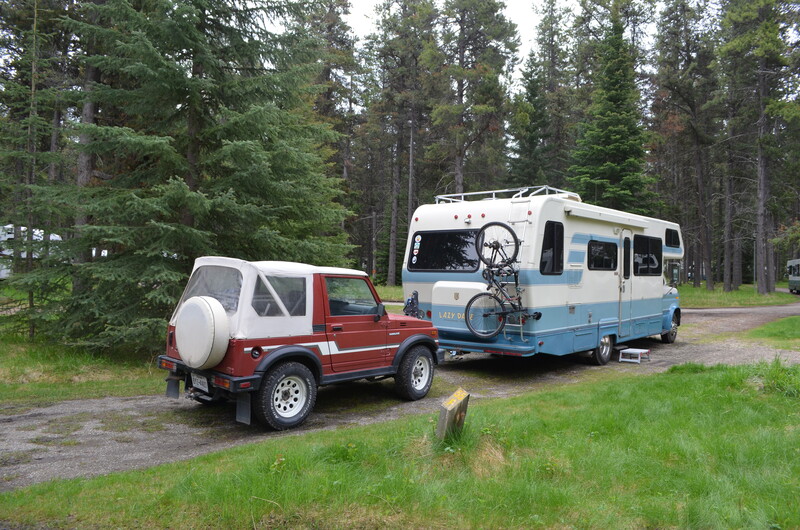 We stayed at the Jasper/ Whistler Campground just a bit out of town. It is a huge campground and we all stayed mostly in one loop making it nice for our happy hours. 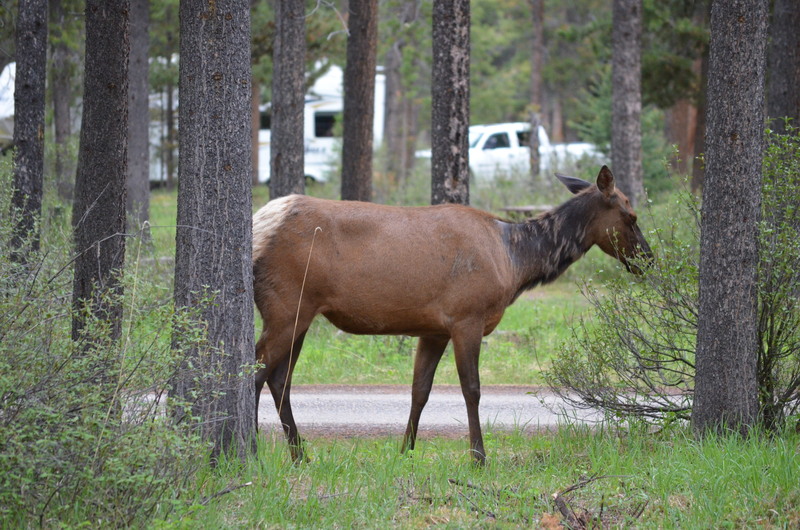 One of the great benefits of staying here is the many elk we saw close up. 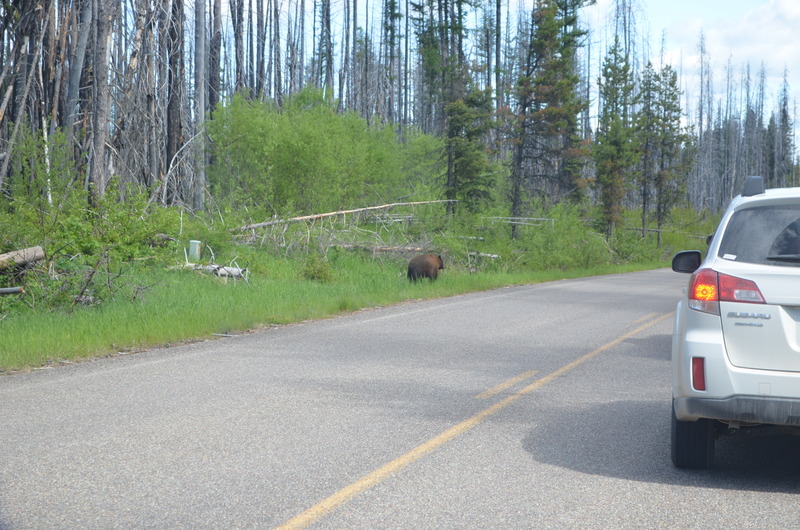 We were told that they stay in the park with their young to keep away from the bears. 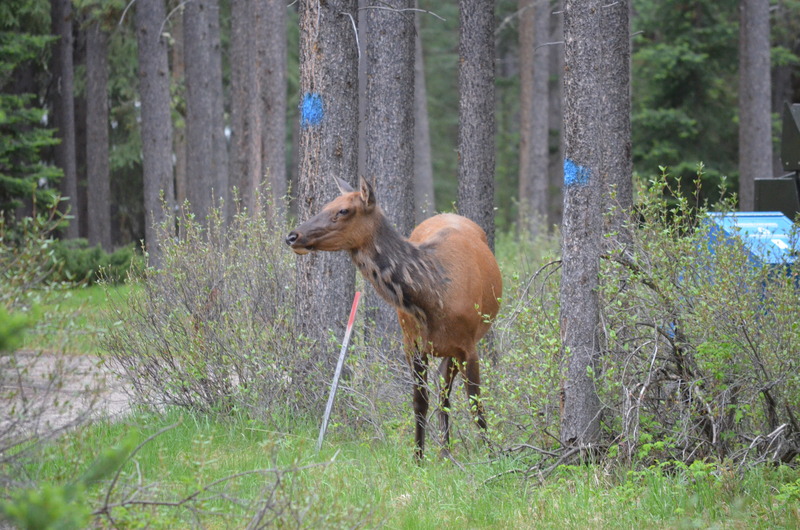 The pictures were great of the elk close up. 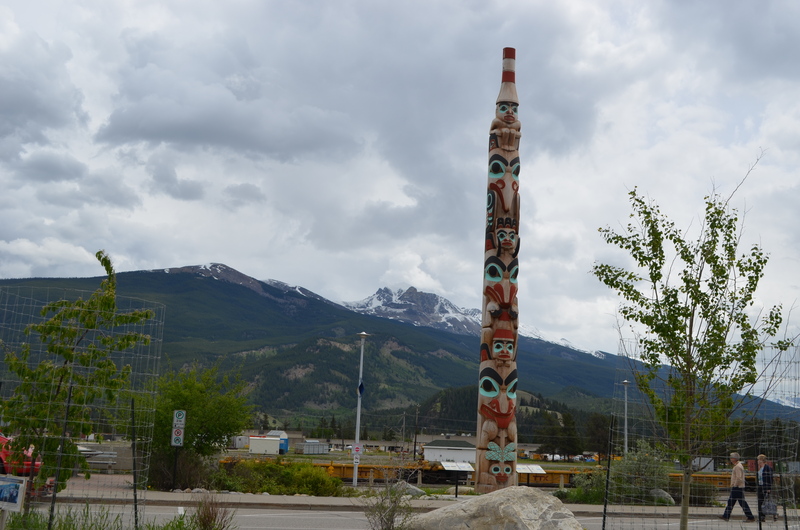 The second day we were in Jasper it stopped raining and turned out to be a beautiful day. 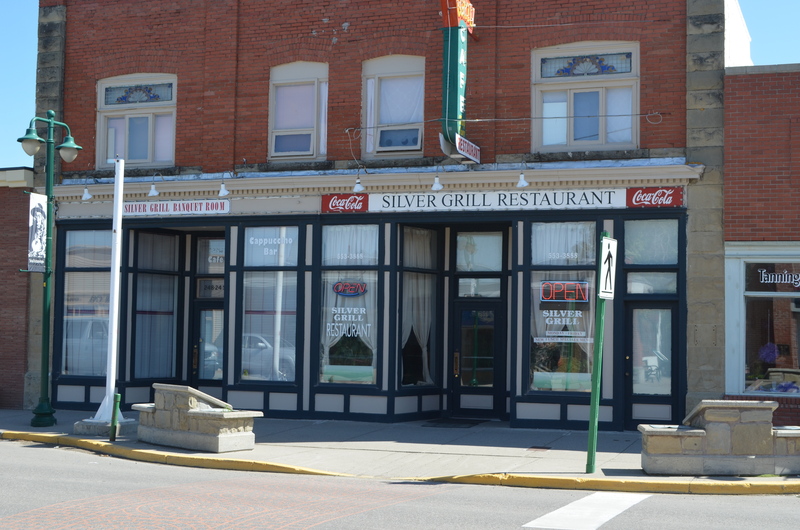 I took a few pics in the town. 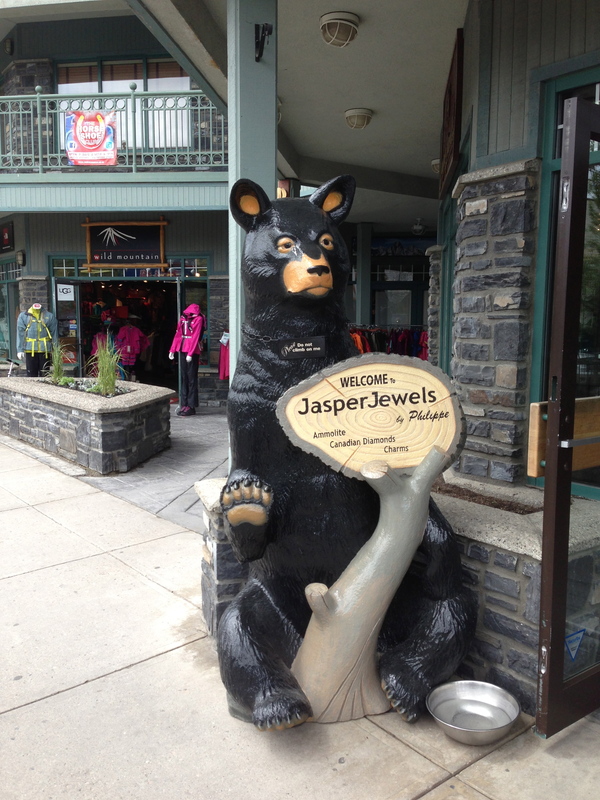 We enjoyed ourselves visiting all the quaint little shops in Jasper and we finally were able to use the Internet at the Visitor’s Center. I wish I had Wi-Fi at each campground as it would be so much easier to keep up with my posts, but unfortunately that is not the case. Sometimes we would not have any Wi-Fi for several days. 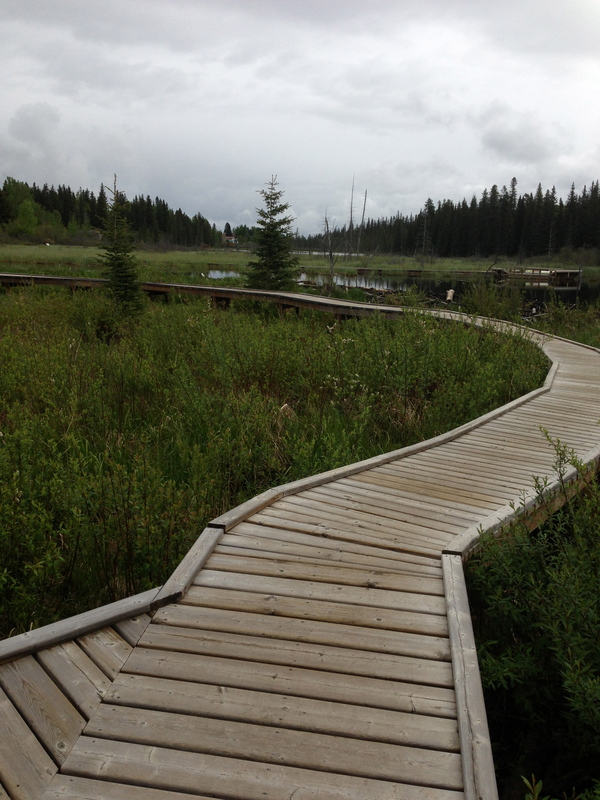 After Jasper and on our way to Edmonton in the town of Hinton we stopped at the Beaver Boardwalk. 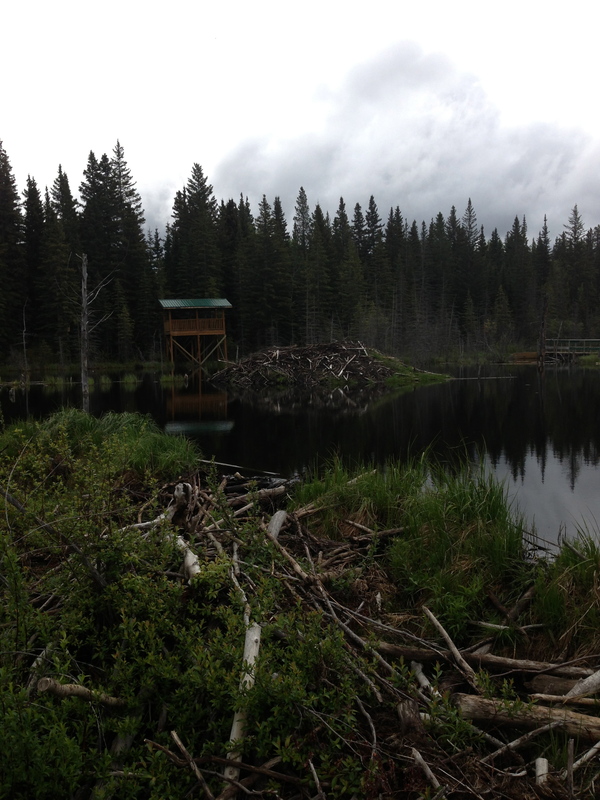 There is a boardwalk that winds through the wetlands and is the home to many beavers. 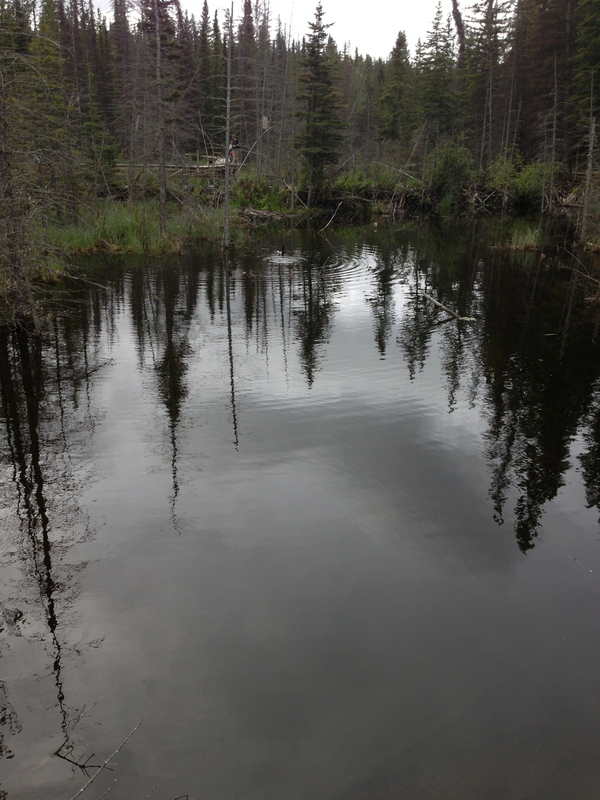 We didn’t see any beavers but saw evidence of their dams everywhere. It had just started to rain so the pics are a bit dark. 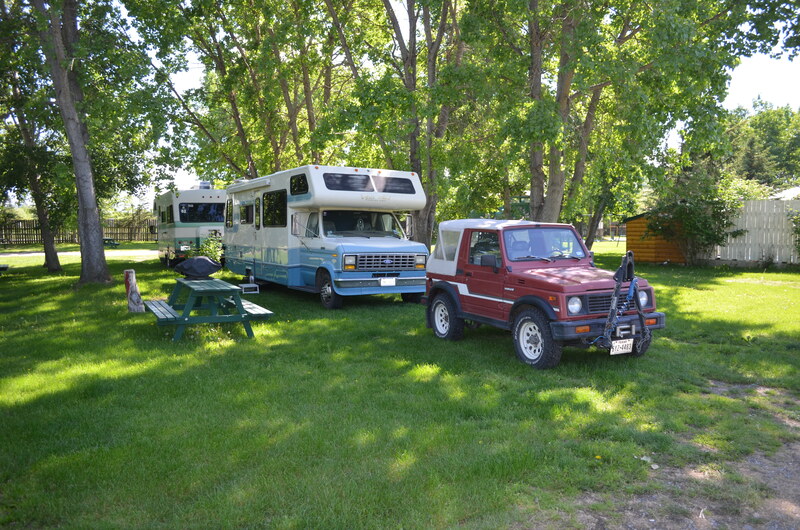 We made it to Edmonton and camped at the Glowing Embers RV Park, which is a huge campground about 8 miles from the mall. 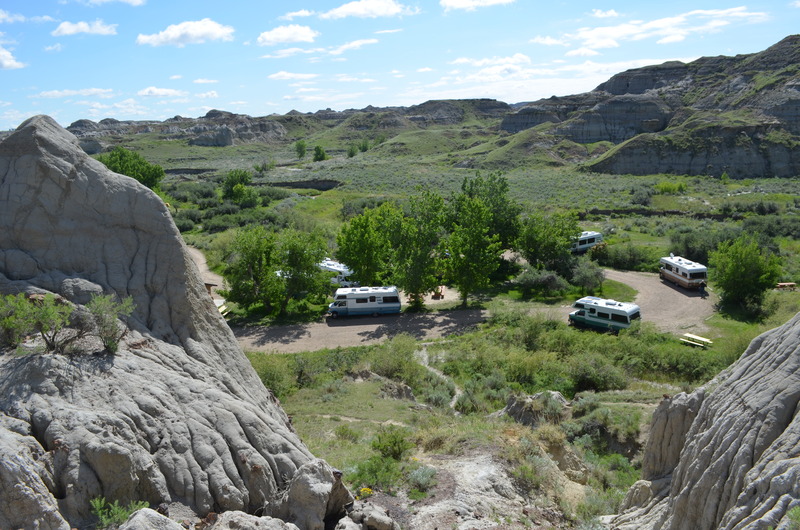 It was the biggest campground I have ever stayed in with over 700 sites. 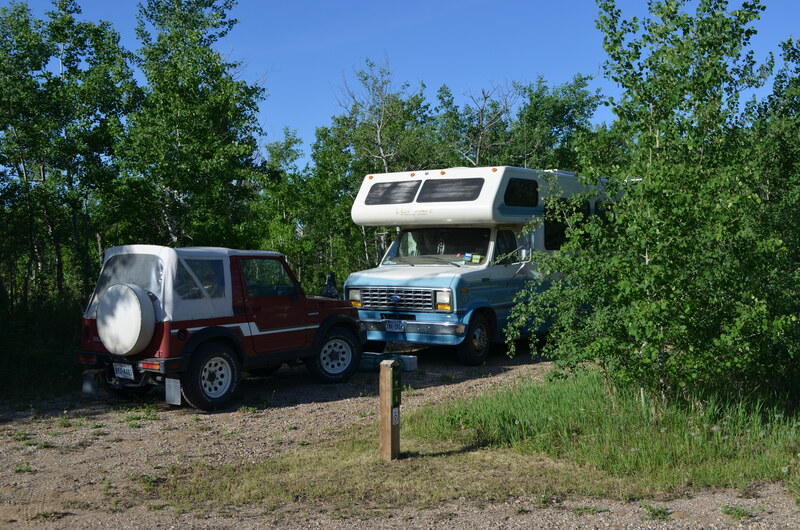 Many of the sites were occupied by permanent residents and there were RV’s of all shapes and sizes. They had Wi-Fi but to get a highspeed connection you had to use the arcade next to their office. We were there 2 nights and on the first full day many of us visited the Edmonton Mall, which is supposed to be one of the biggest mall in the world. Big is not a good name to describe it. HUGE is much better. We only were in about 1/3 of the mall and we saw many things you would never find in a mall. 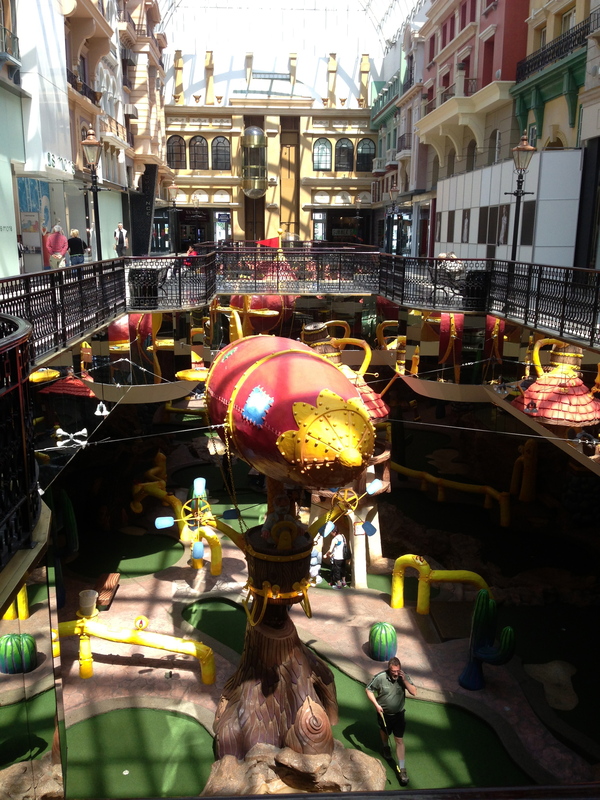 There was a huge children’s play area. 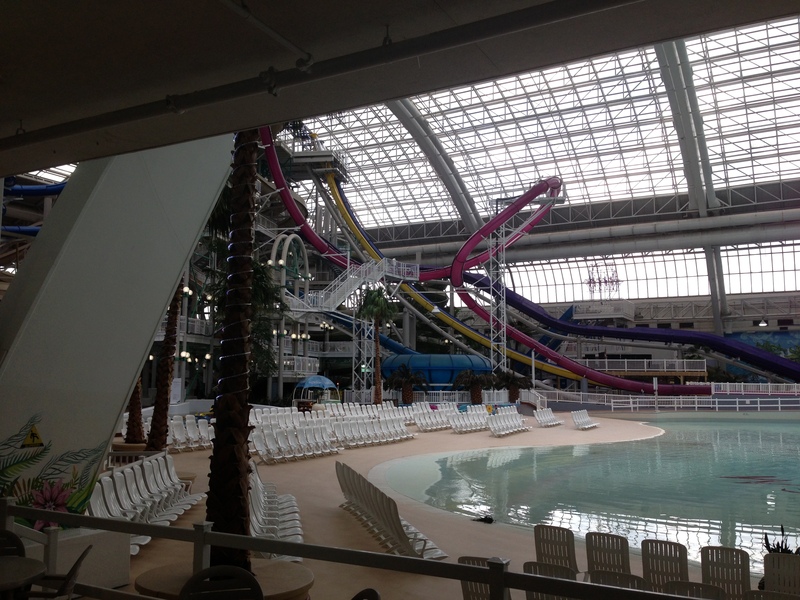 A indoor swimming area complete with huge water slides. 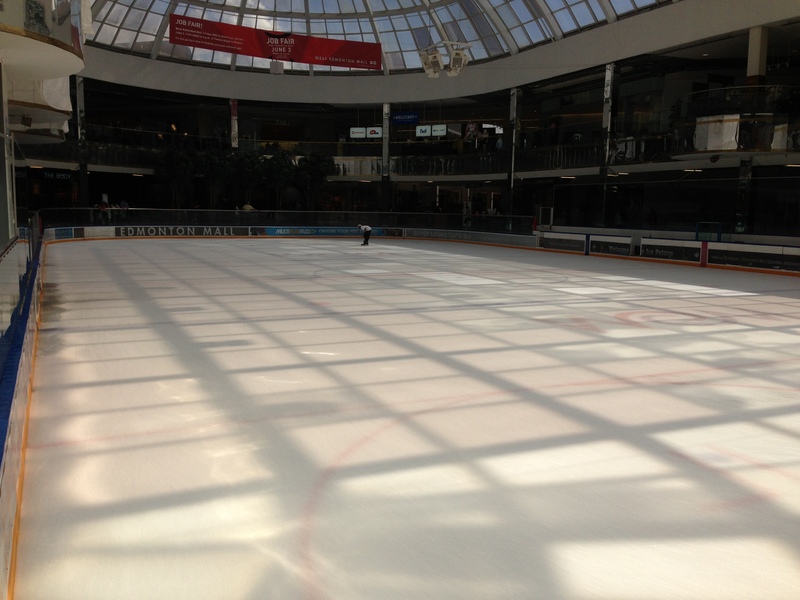 then there was the full size hockey/skating rink. 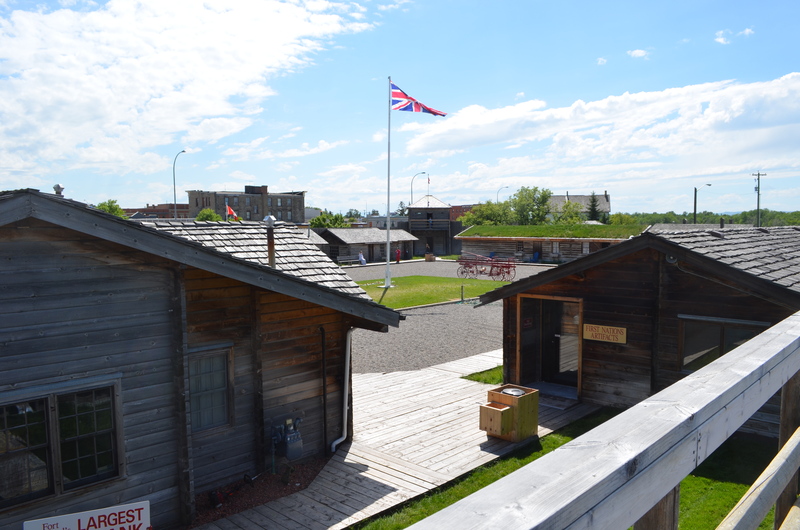 After leaving Edmonton our journey headed for the “Iron Horse Trail”. 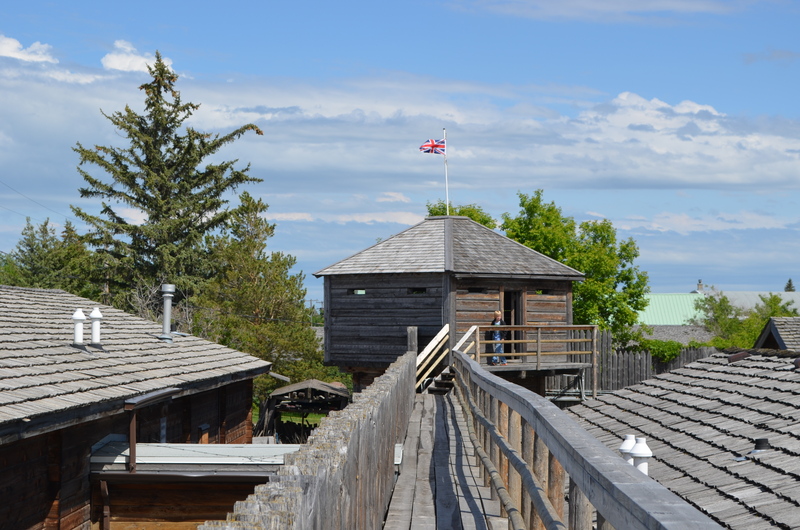 We stopped at a small settlement know as the Victoria Settlement. We were given a great tour of the entire settlement by a student guide. 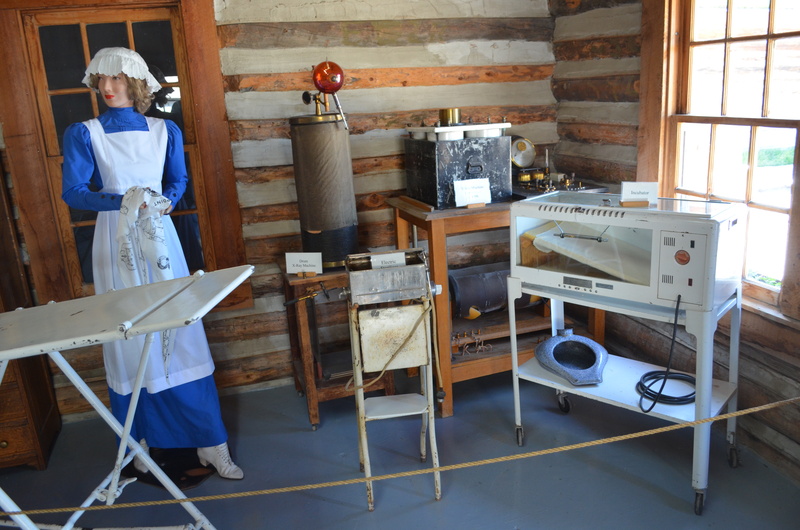 She told us many of the details of how life existed when the settlement was first formed. 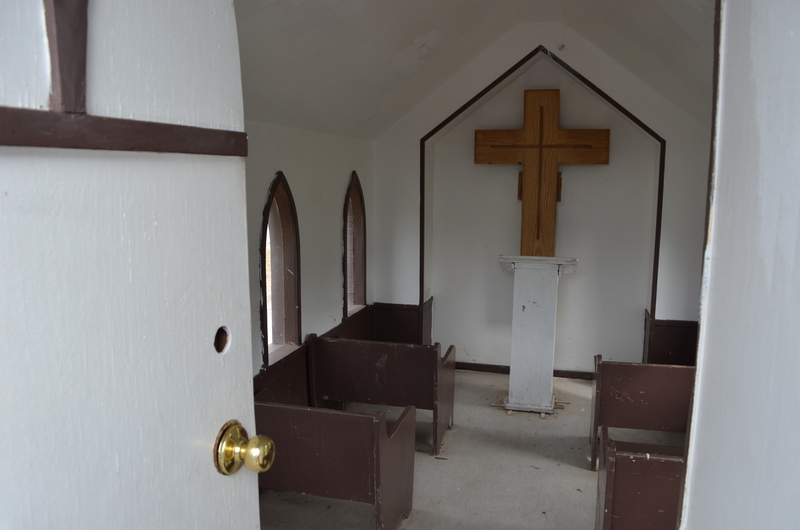 We started by watching a short video in a church that was built in 1906 about life in the settlement. 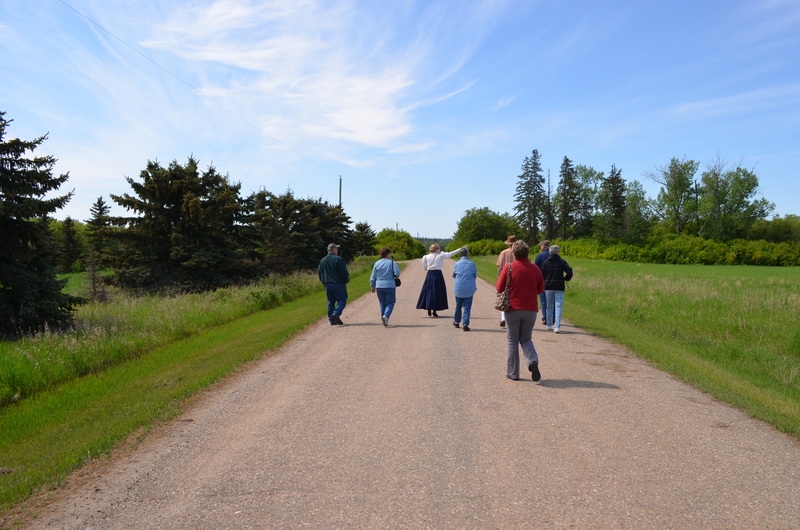 then she took us on a very informative walk around the entire settlement. 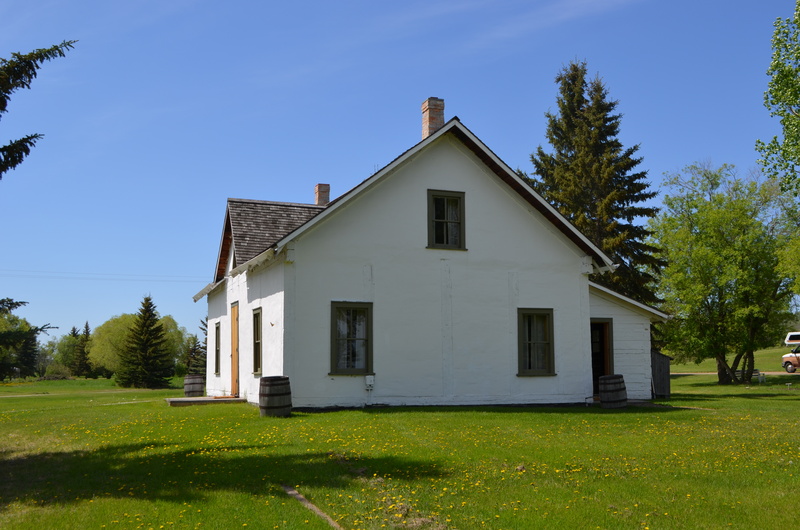 This is the clerk’s quarters built in 1864 and still standing in it’s original spot. The tour lasted 2 hours and then it was on to Whitney Lake Provincial Park. This was bear country and it we opted not to use the electricity as it was only a one night stay. One thing I may have forgotten to mention is that it stays light until 10:00pm. That was very hard to get used to. This is a pic of my site. 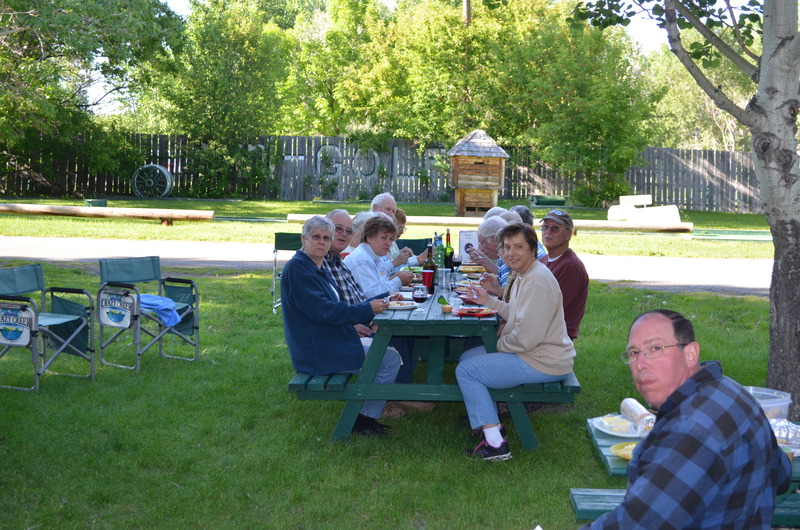 The following day we drove 186 miles to the Miquelon Provincial Park where we had a group site for all of us. 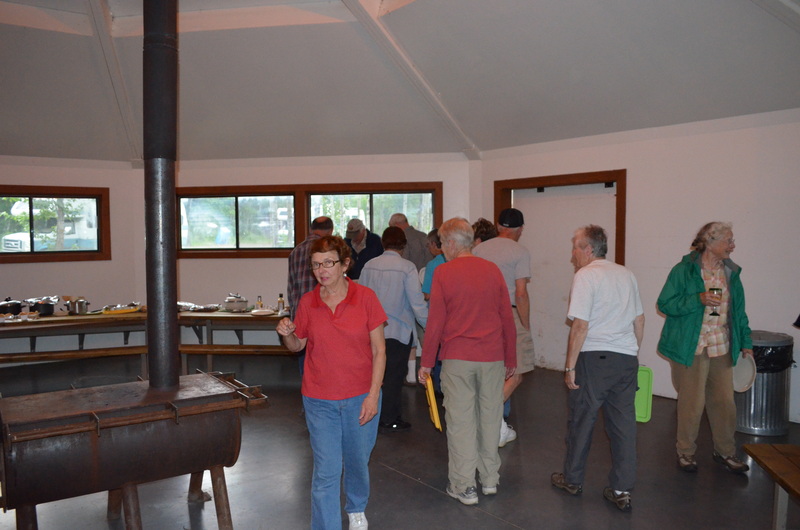 They had an nice room indoors where we all participated in a great potluck dinner. It was a good thing we were indoors as a huge thunderstorm hit the area at the same time. We all had a great time and stayed nice and dry, but we had to make mad dashes to our rigs it was raining so hard.